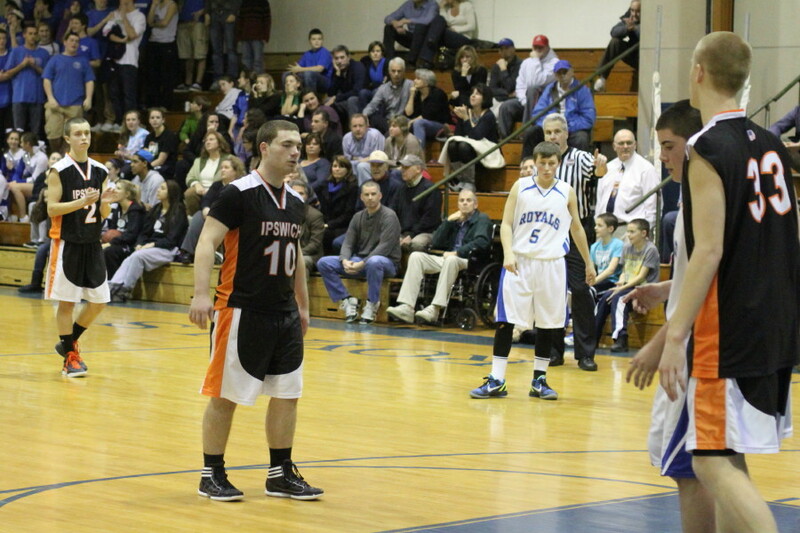 Brenden Gallagher steps back after making the first of two clutch free throws. 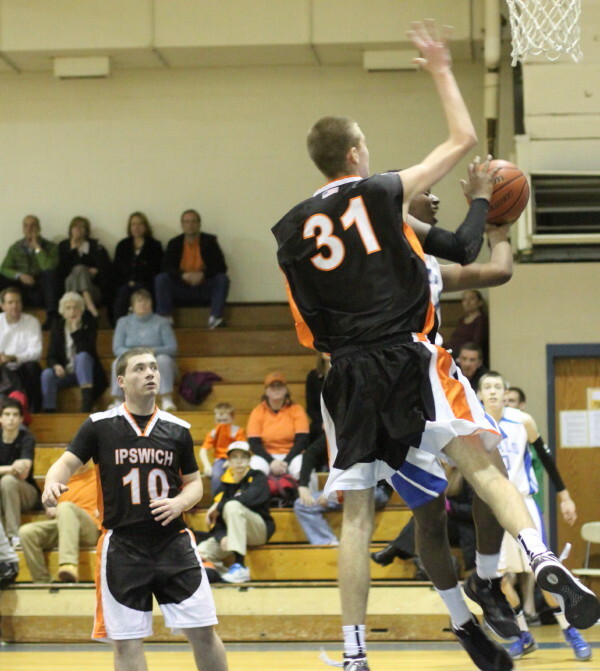 (Georgetown) Brenden Gallagher had an assist and two free throws in the last thirty seconds to help Ipswich get past Georgetown, 55-51, in non-league action on Monday night at GHS. The Tigers defeated the Royals on January 13th (61-41) at Ipswich but this one was much more of a struggle. The home team went down by eleven (34-23) early in the third quarter but fought all the way back to a 40-40 tie early in the final quarter. 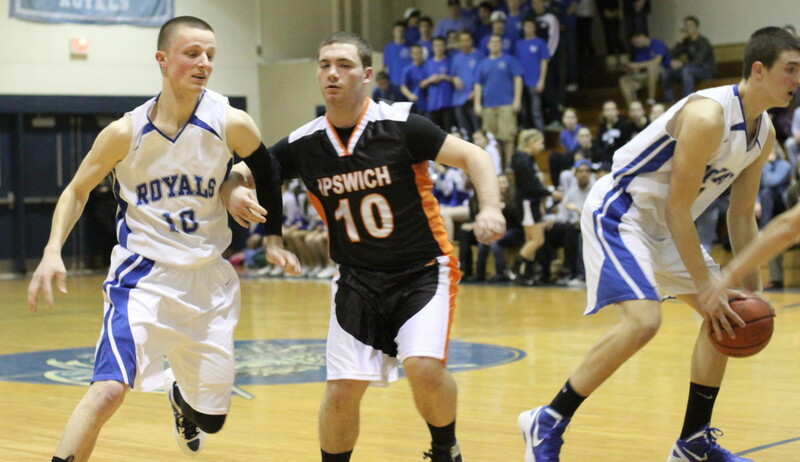 Ipswich went up by six a couple of times after that (48-42 & 50-44) before three straight Tyler Wade assisted baskets knotted the score at 50-50 with ninety seconds left. During the Royal comeback, 6-6 Pat Bjork twice rushed back to intimidate Ipswich shooters (Dan O’Flynn and Matt Jaeger) on breakaways. Erik Fyrer (21 points) and Cesar Miranda-Black (14 points) traded single free throws (51-51) before Erik cut down the lane and received a perfect pass from Brenden Gallagher for the go-ahead layin with thirty second left. A Pat Bjork miss and Jon Fierro’s block of Cesar Miranda-Black’s rebound attempt gave the ball back to the Tigers with thirteen seconds left. Brenden Gallagher was immediately fouled and made both freebies despite plenty of noise from the Georgetown student section. Now up four (55-51) the Tiger defense put heavy defense on Tyler Wade and he wasn’t able to get off a quick three instead had to settle for a wild three that ended the contest. 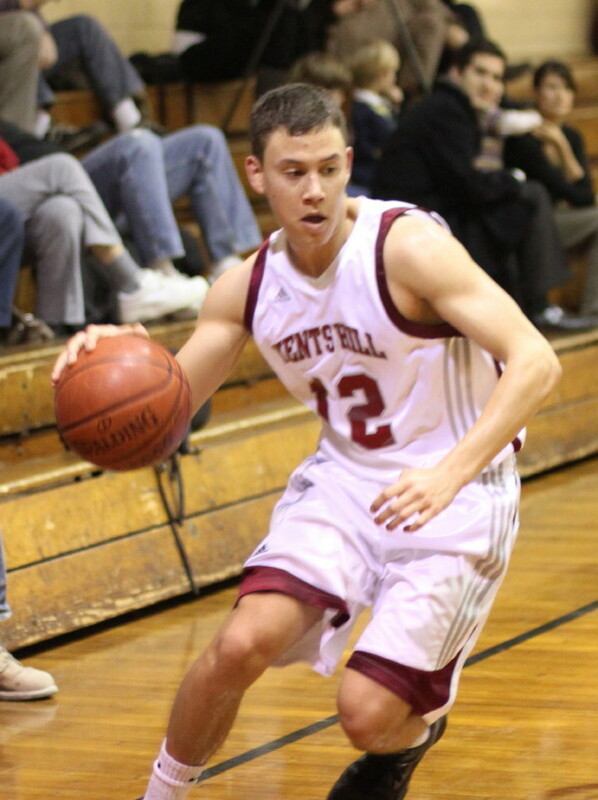 Erik Fyrer (21 points) had a big game. 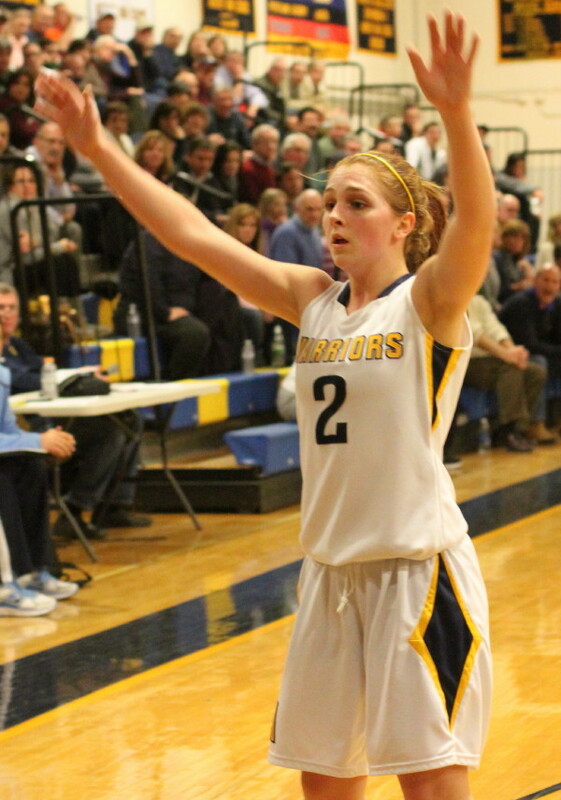 The 6-4 sophomore converted six offensive rebounds into points. 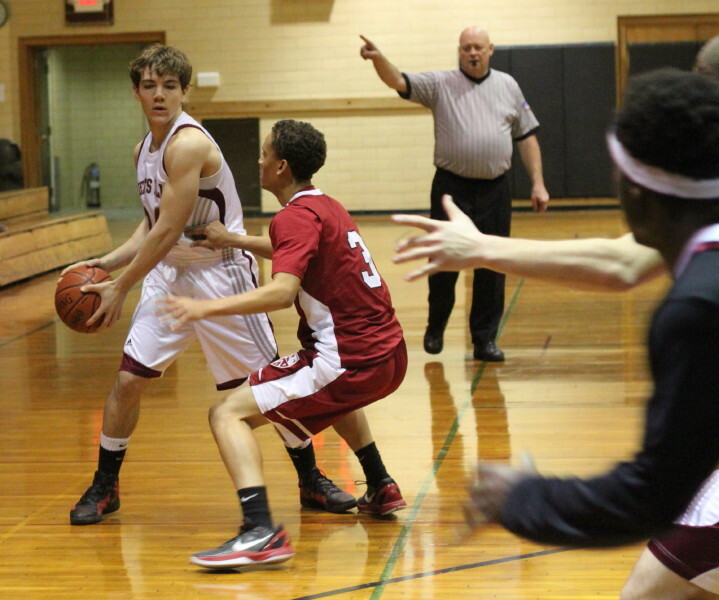 He also had a steal on an inbounds pass for an easy layup. 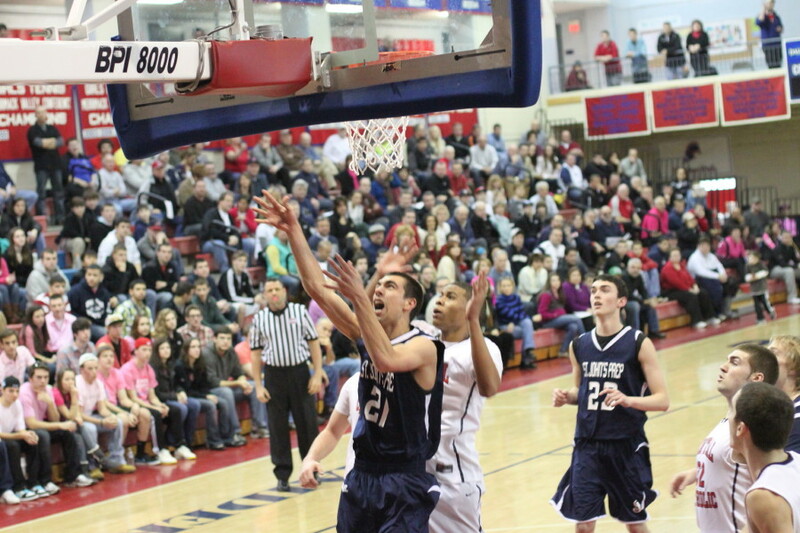 Senior Jon Fierro had three blocks including the one very late as G’Town tried to tie the score. Brenden Gallagher (8 points and 3 assists) defended Tyler Wade into a quiet (for him) nine points. Tyler had seventeen in the first meeting. 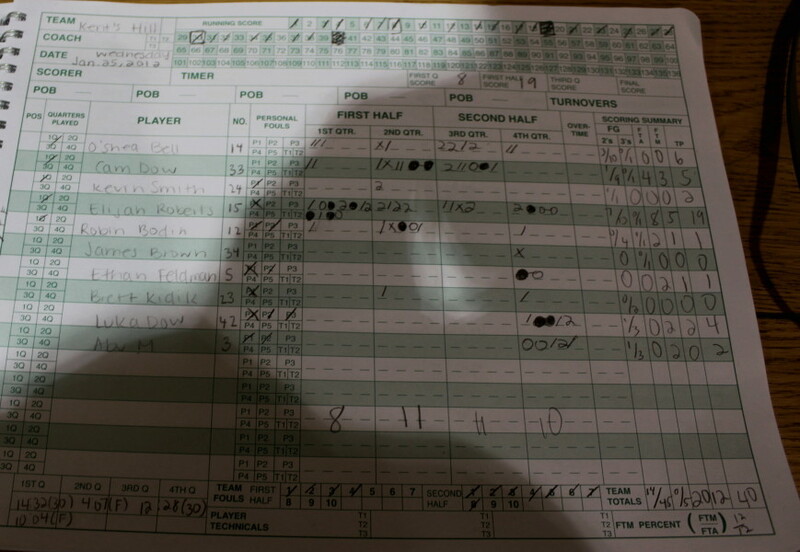 Cesar Miranda-Black (14 points) did his damage in close. 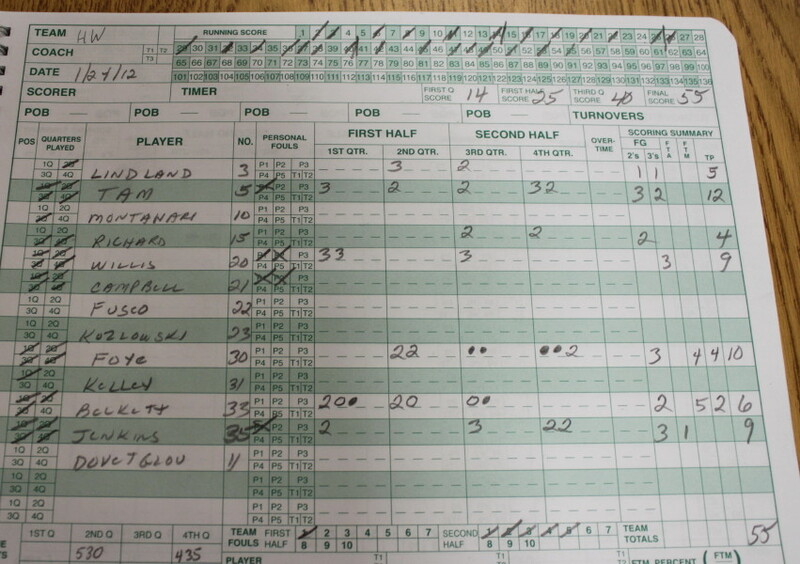 Georgetown was 12-for-21 shooting free throws – Ipswich 11-for-15. Christian Gesualdi made the Royals only 3. 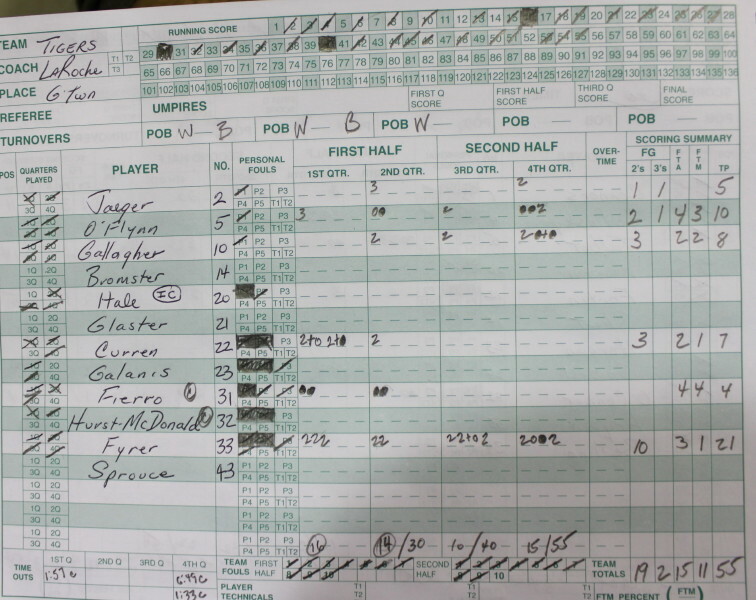 Matt Jaeger and Dan O’Flynn (10 points) had long ones for the Tigers. 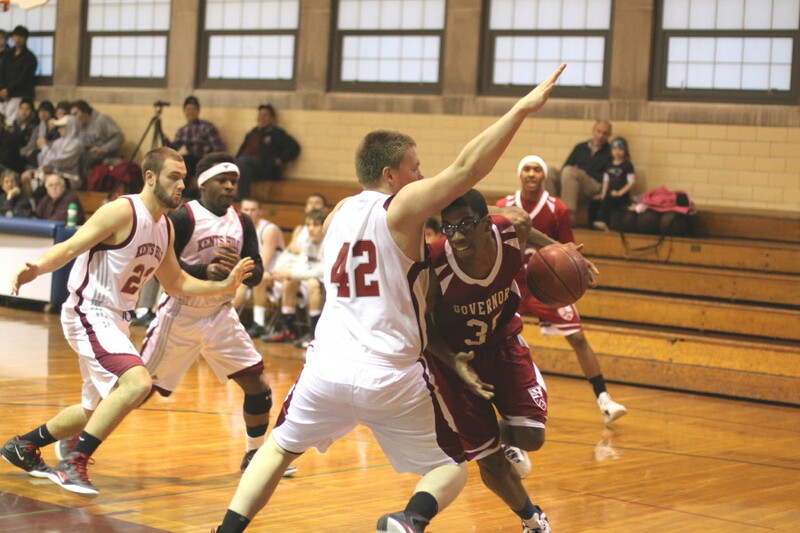 Georgetown ( 1-6 in the Cape Ann League / 4-10 overall ) is at North Reading tomorrow (Tuesday). The Royals have lost eight of their last nine. Ipswich ( 2-5 in the CAL / 4-9 overall ) has now won three of their last five. 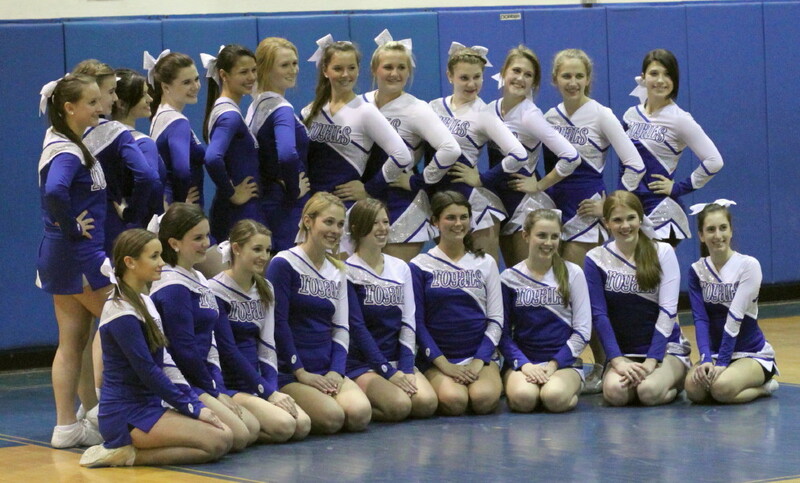 They host Lynnfield on February 3rd. 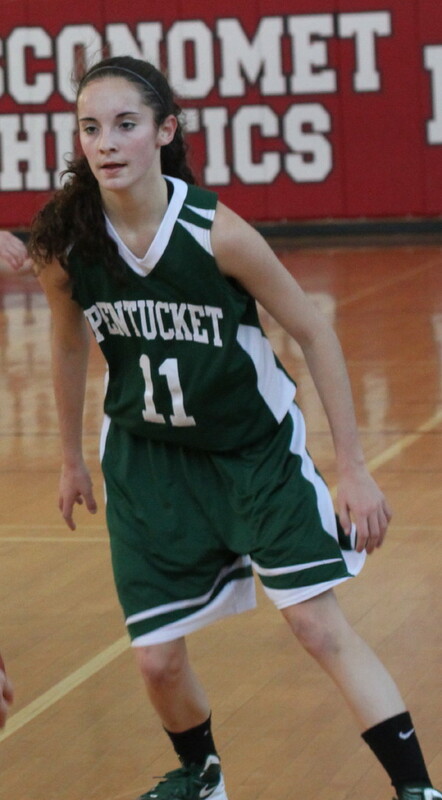 Coley Viselli (16 points) made three free throws in the last fourteen seconds to seal the Pentucket win. 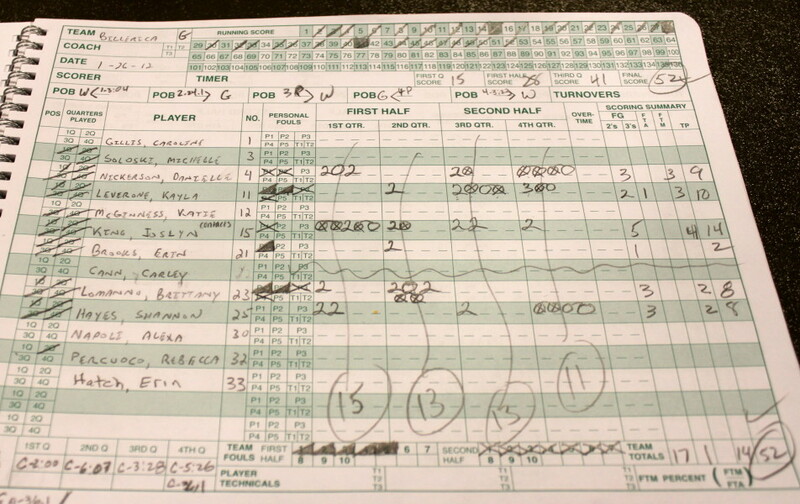 Chelsea Nason (17 points) connected on five triples. 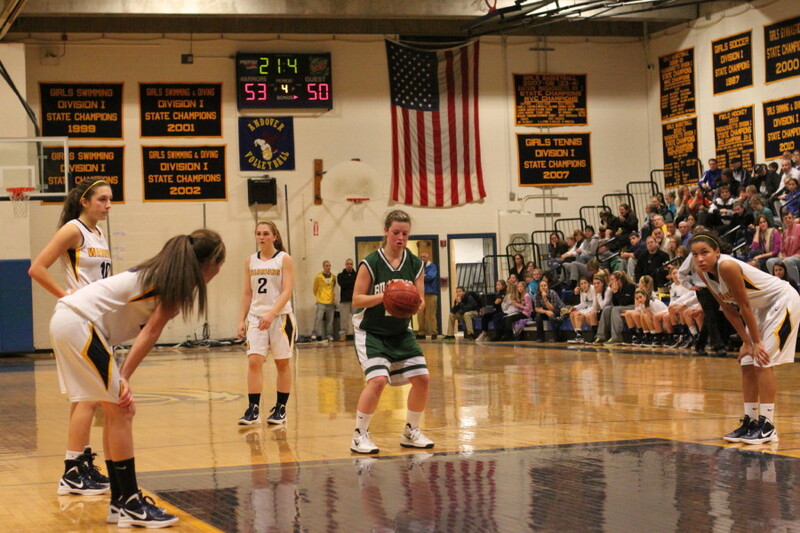 (Topsfield) Before a sizable Sunday afternoon crowd, Pentucket turned a strong final two minutes into a, 57-54, win over Masconomet in a matchup between two of the best girls teams in the state. Evenly matched? How about eleven ties over the course of the game with five of them in the frantic last quarter? 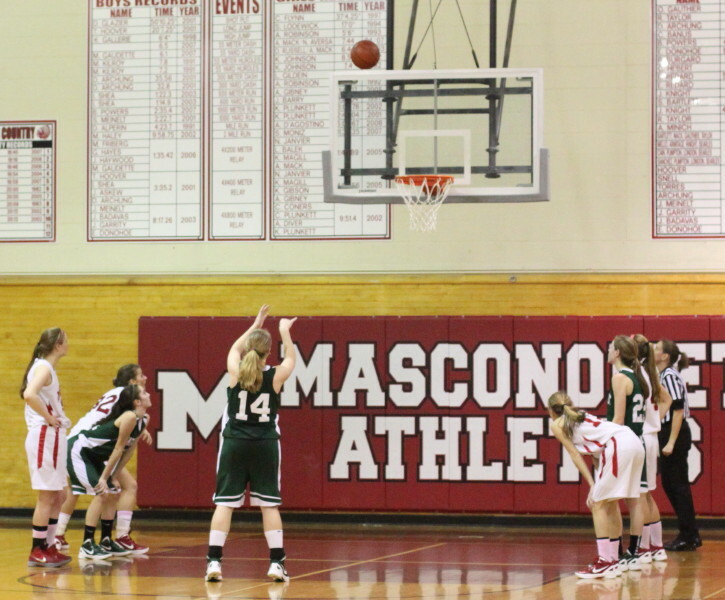 After the last tie (47-47) with 2:54 left, Masco broke out with a triple by Chelsea Nason (17 points) and two Danielle Davis (9 points) free throws to get up by five (52-47) with 2:13 left. 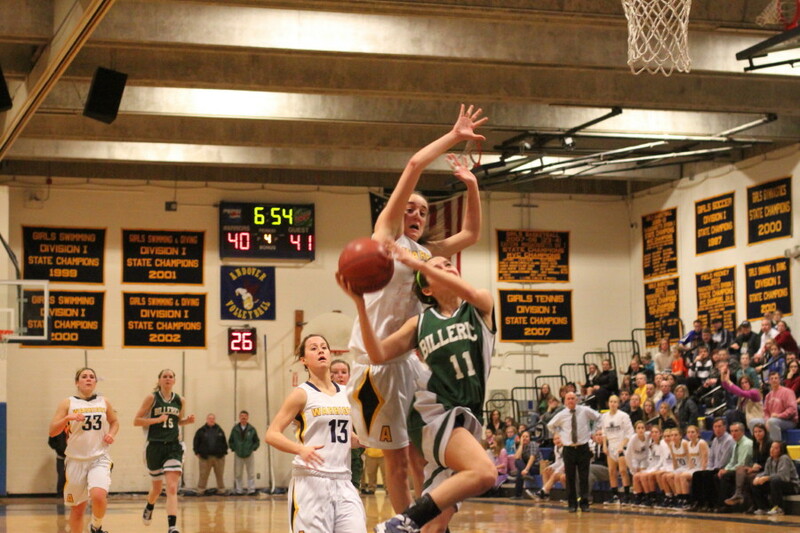 Pentucket’s response won the game for them. 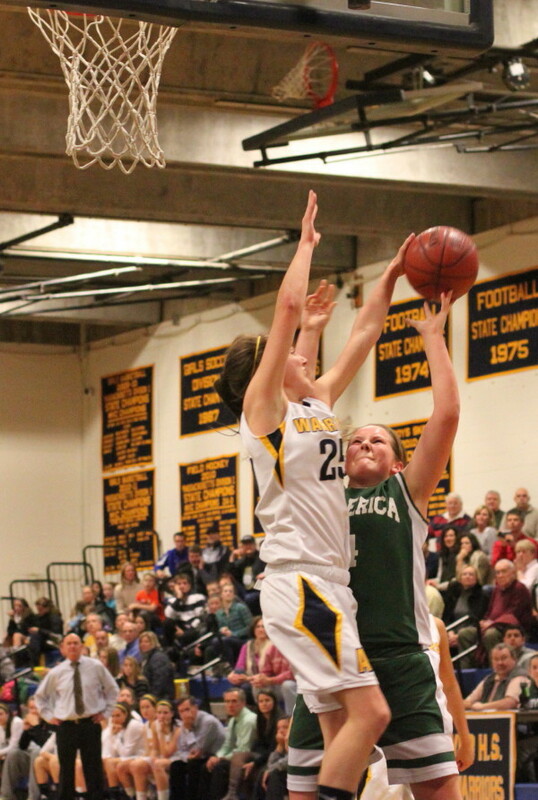 Two freebies by Sarah Higgins (she was an amazing 9-for-9 from the line), a driving layup by Alex Moore, and gutsy triple by Alex (from Kelsi McNamara) went unanswered by the Chieftains. 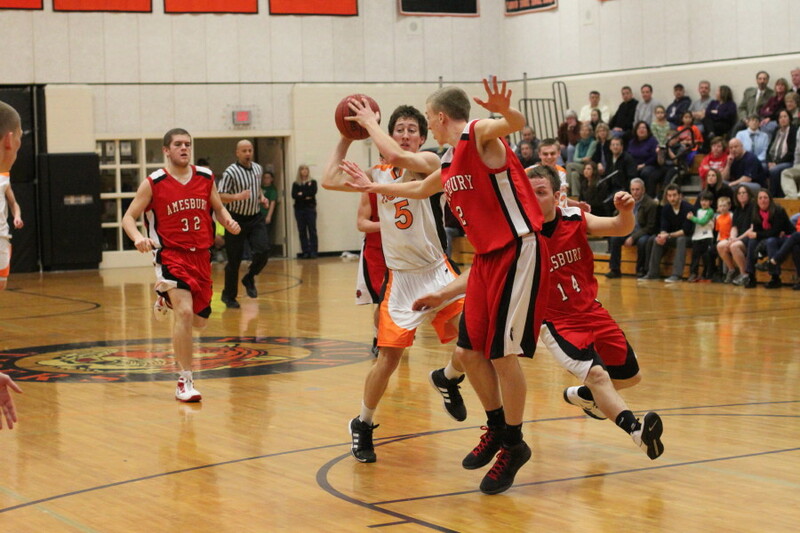 This consecutive action put the Sachems on top, 54-52, with thirty seconds left. 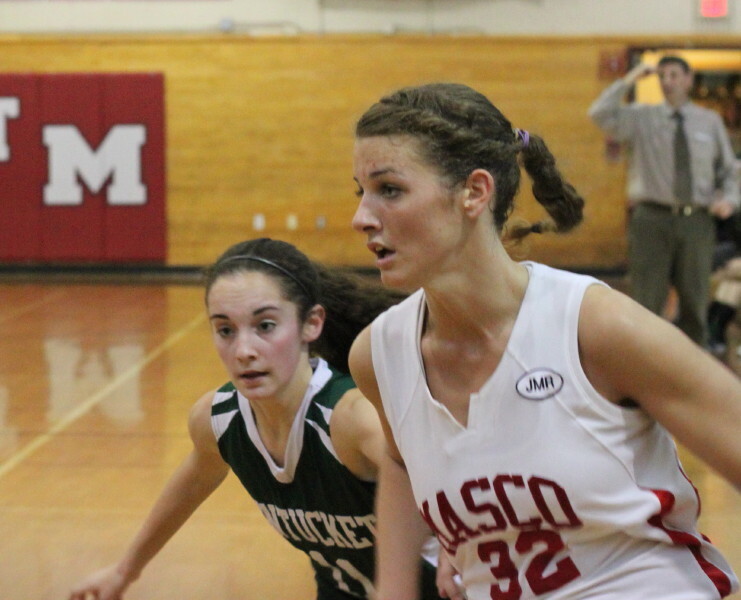 Masco’s Katie Hutchinson missed the front end of a one-and-one with fifteen seconds left. 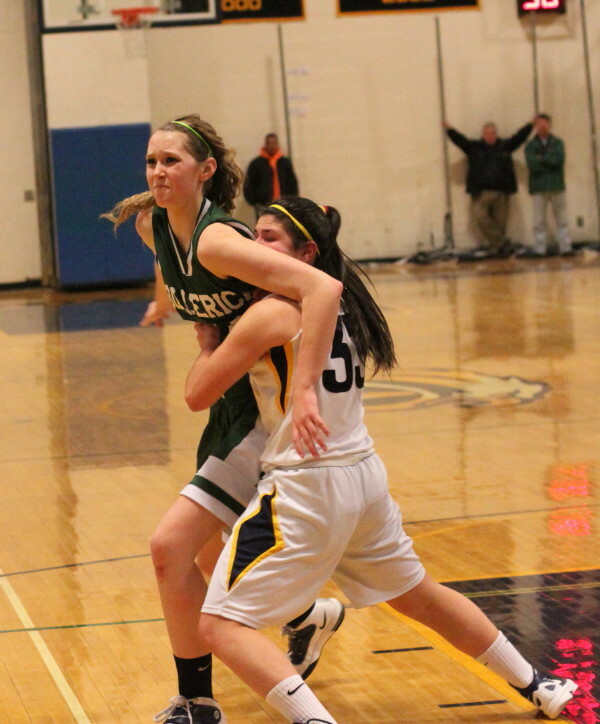 Coley Viselli (16 points) took the rebound and was immediately fouled. 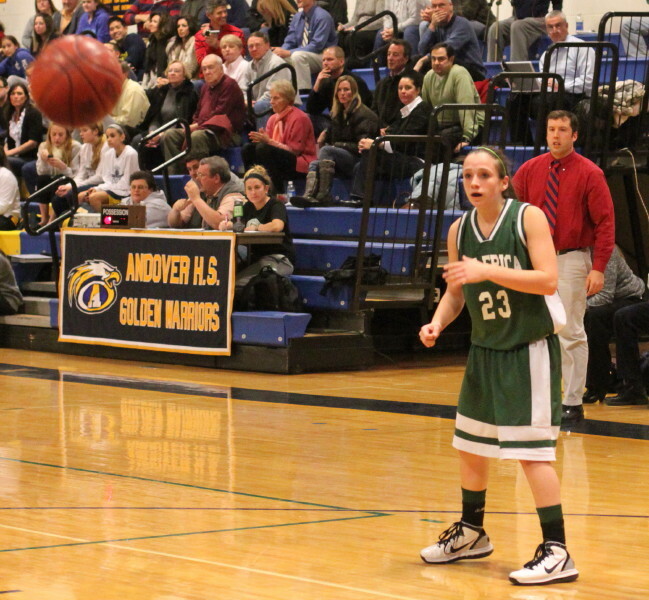 She made both free throws to stretch the Pentucket advantage to 56-52. 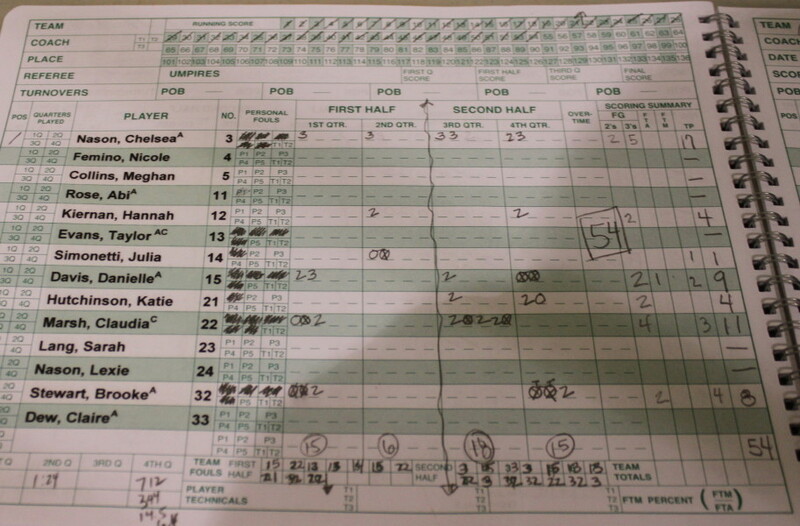 Brooke Stewart (8 points) drove the length of the court to close her team’s deficit to two (56-54) with six seconds left. 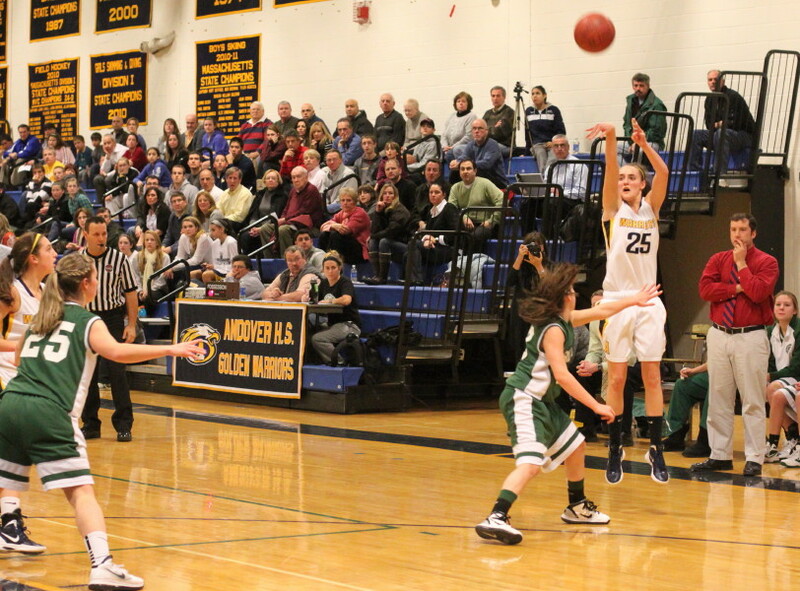 Coley Viselli received the inbounds pass and Chelsea Nason (5th foul) sent her to the foul line with five seconds left. Coley missed the first and made the second. 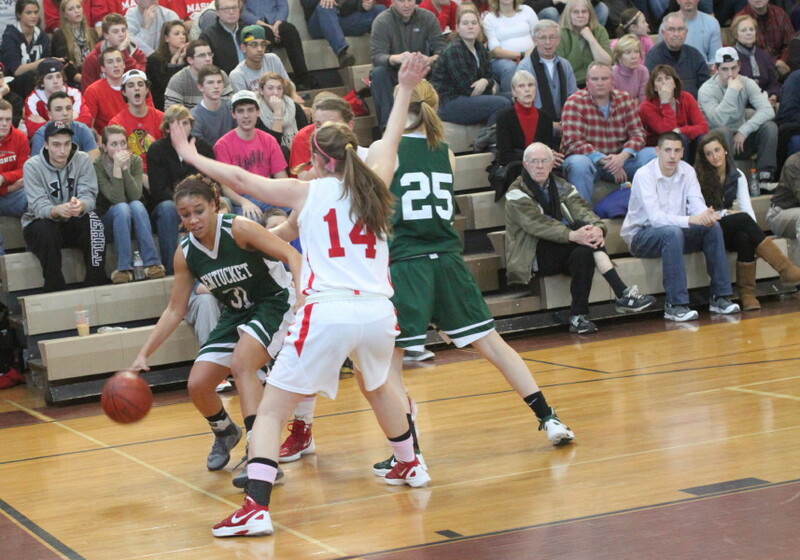 Danielle Davis dribbled to midcourt before attempting a tying long one that went wide as time ran out. 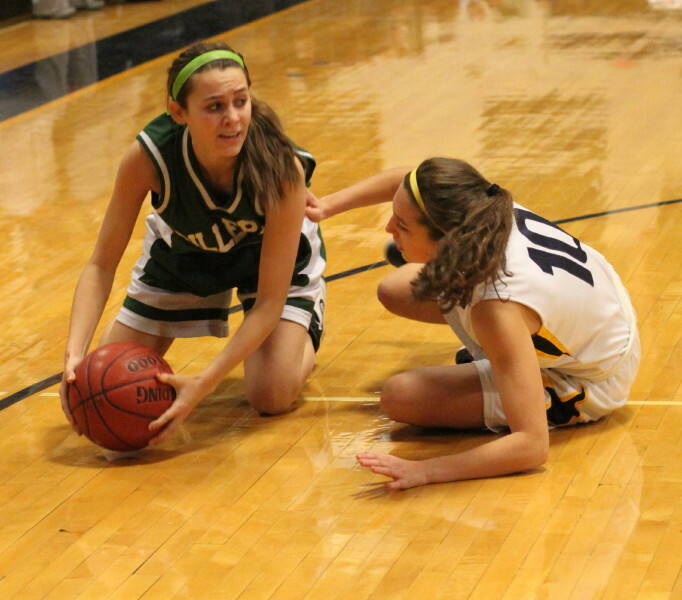 If Chelsea Nason hadn’t fouled out she probably would have been the one taking the last shot. She had connected on five 3’s during the game. 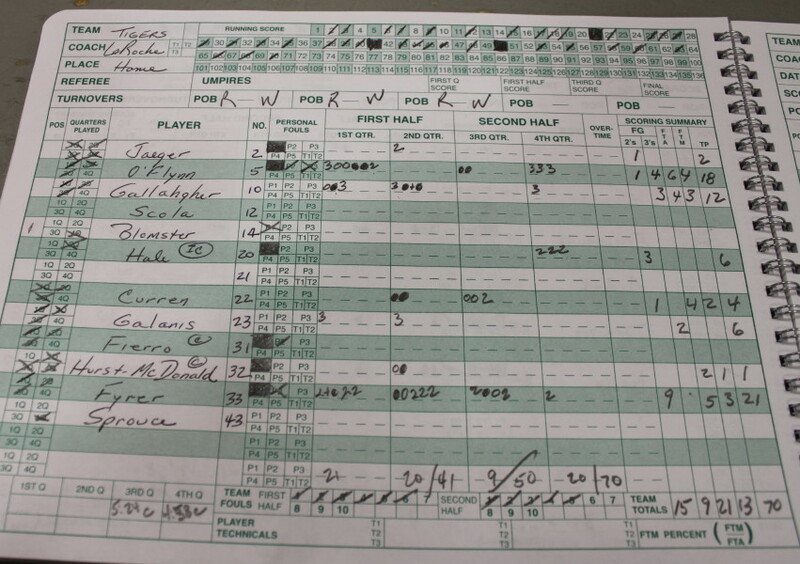 The foul shooting was excellent for both teams. 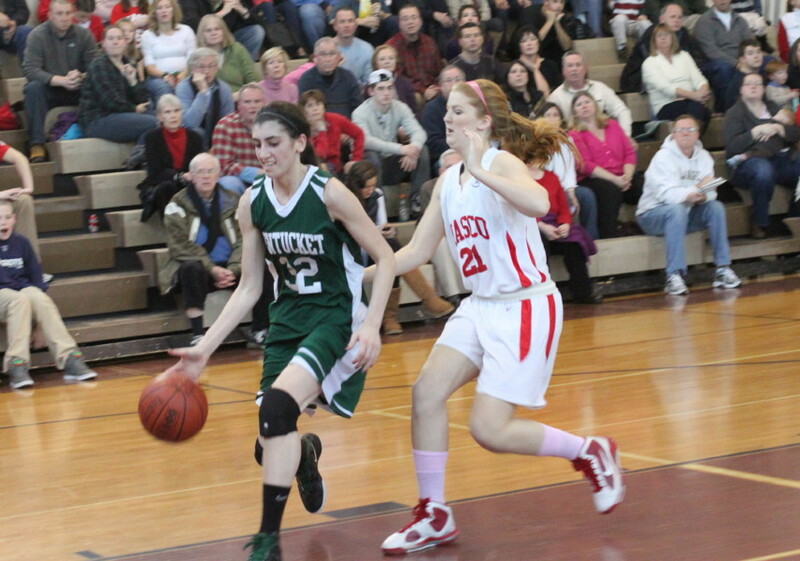 Pentucket made 21-of-25 while Masco hit 10-of-13. 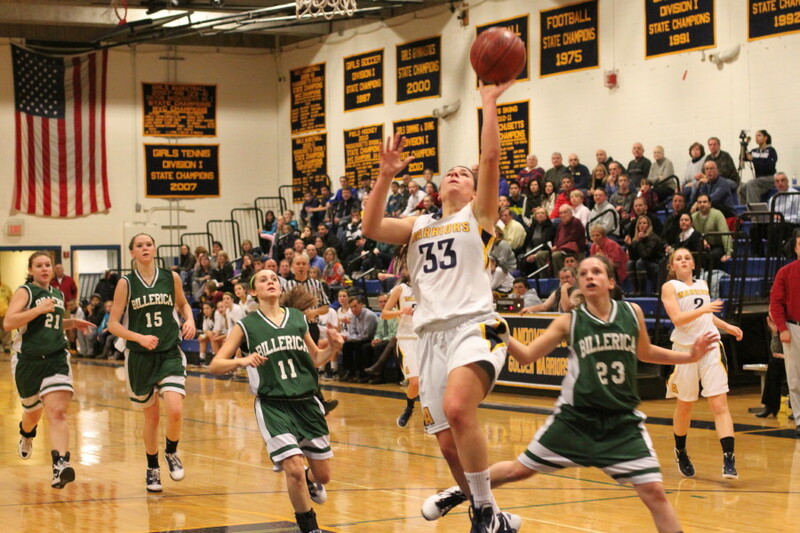 The Chieftains started the second period with six unanswered points (21-15) before the Sachems strung thirteen unanswered back (28-21) over the next eight minutes of playing time stretching into the third quarter. 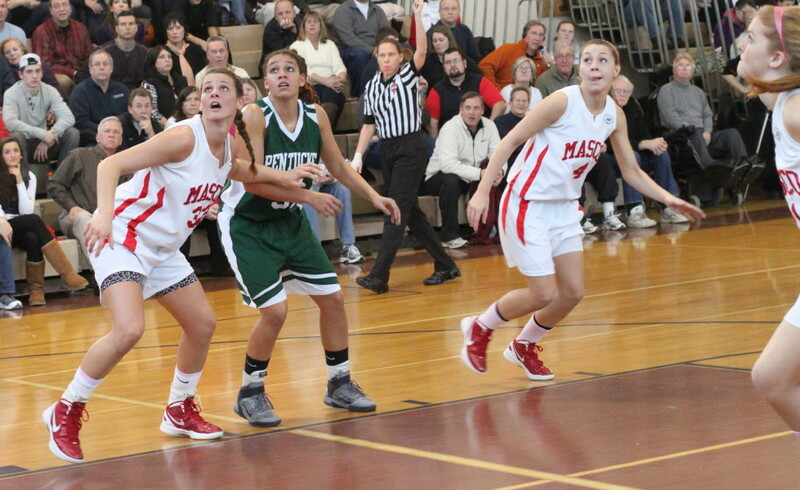 Chelsea Nason’s triple midway through the third quarter finished Masco’s rally back to a 32-32 tie. Seven ties followed the rest of the way. 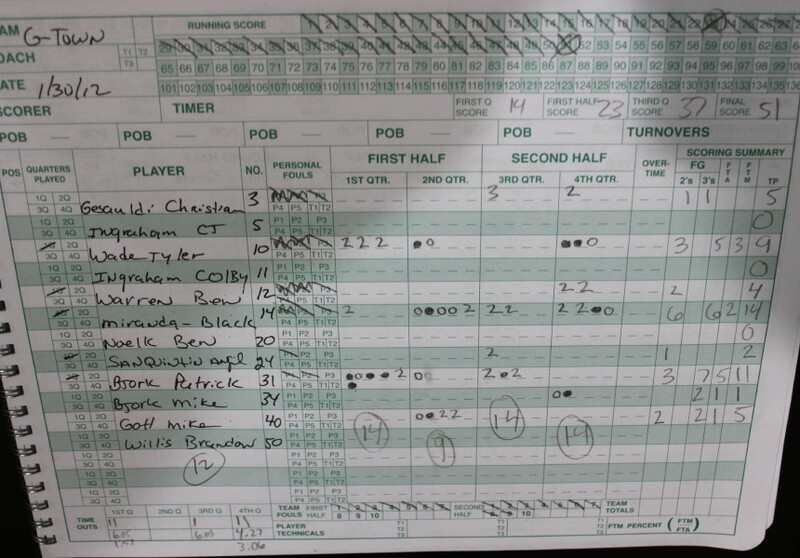 Pentucket closed with a 10-2 game-decider. Pentucket (7-0 in Cape Ann League D1 / 11-4 overall) lost Tess Nogueira (groin injury) with a minute left in the third quarter and the score tied at 37-37. 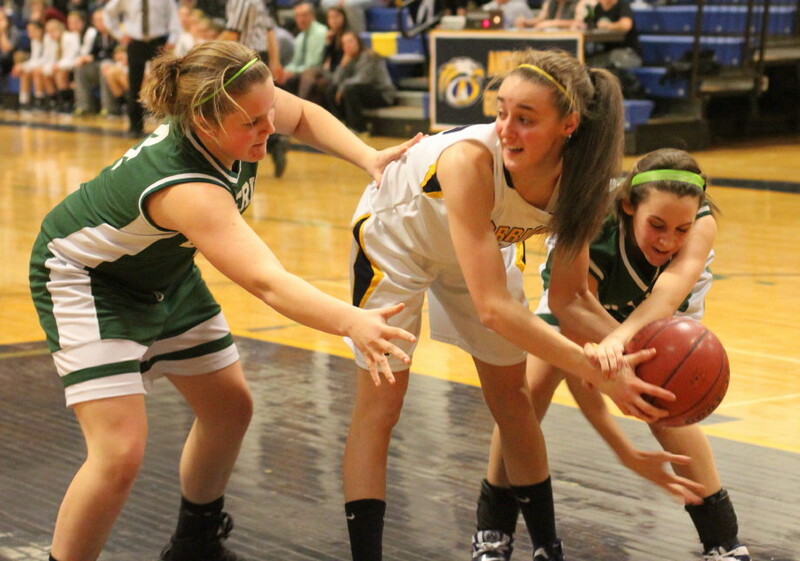 I thought at the time that Pentucket might be in serious trouble because Tess had shadowed Brooke Stewart into a non-factor status. But Alex Moore took over and, although at least six inches shorter than Brooke, was able to limit the talented senior to just four points the rest of the way. Besides the good fill-in defense, Alex (13 points) put up seven in the final quarter including the go-ahead triple with thirty seconds left. 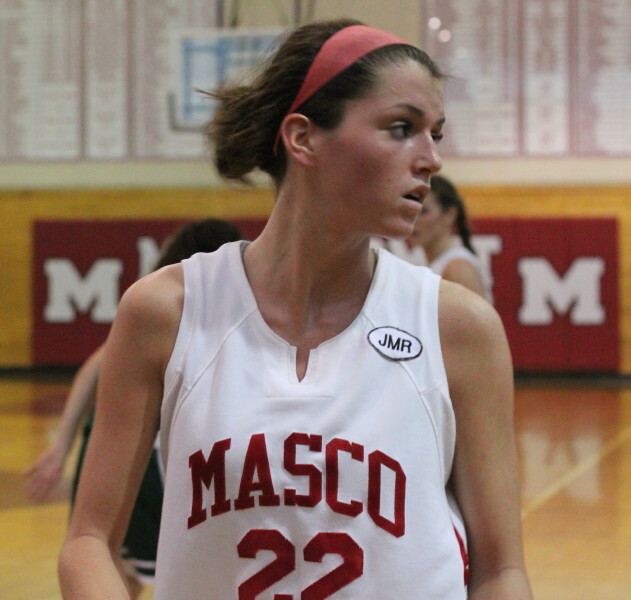 Masco (5-1 in CAL / 9-2 overall) had won seven of their last eight games before today’s loss. 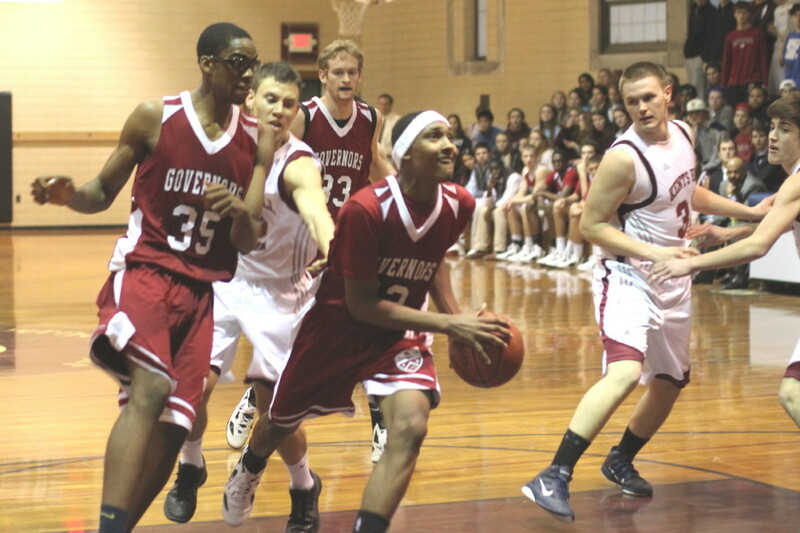 I saw them defeat a highly regarded Central Catholic team in Lawrence last Sunday. 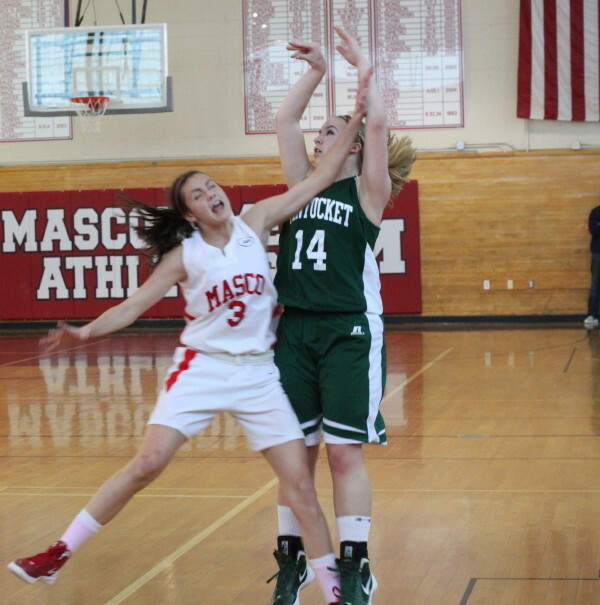 Both Masco and Pentucket are in Division 1 of the Cape Ann League. 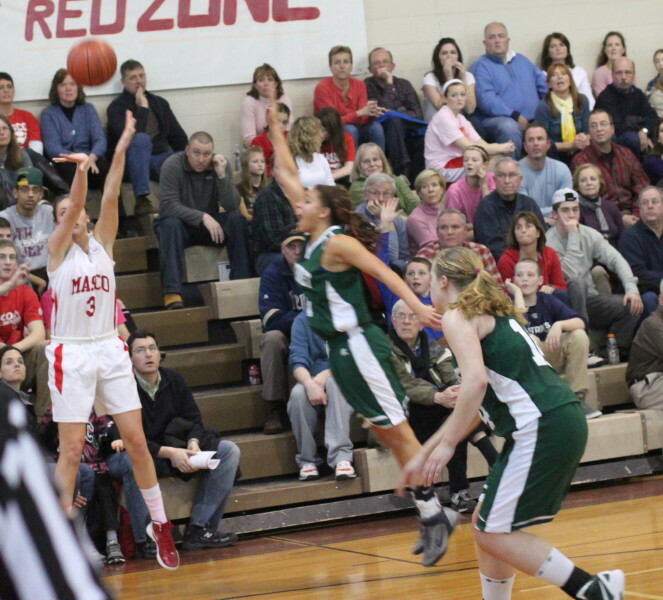 When it comes to the MIAA tournament, however, Pentucket slides down to Division 3. 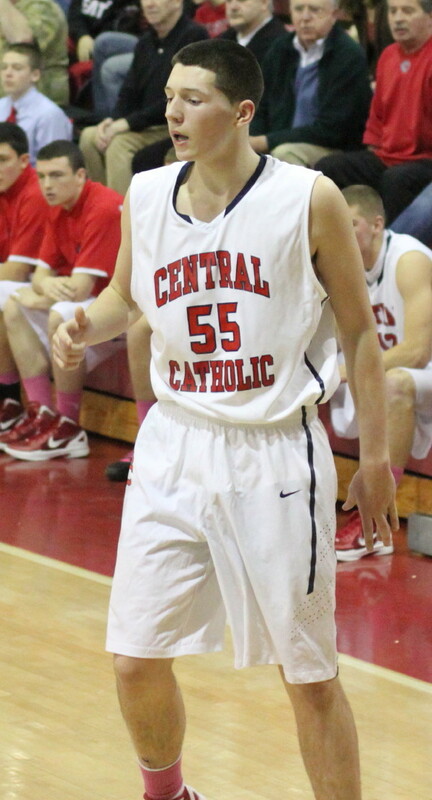 Could that have been why St. Mary’s Jeff Newman was in the house?? 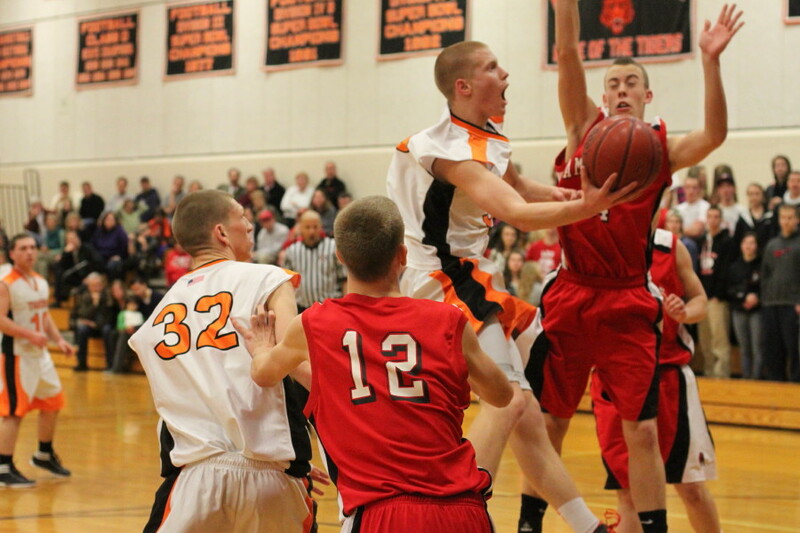 I saw Jeff’s Spartans oust Pentucket from the tournament last year at Wilmington. Two of the most sideline-active coaches were in action today and it was hard not to watch them even as the game was going on. 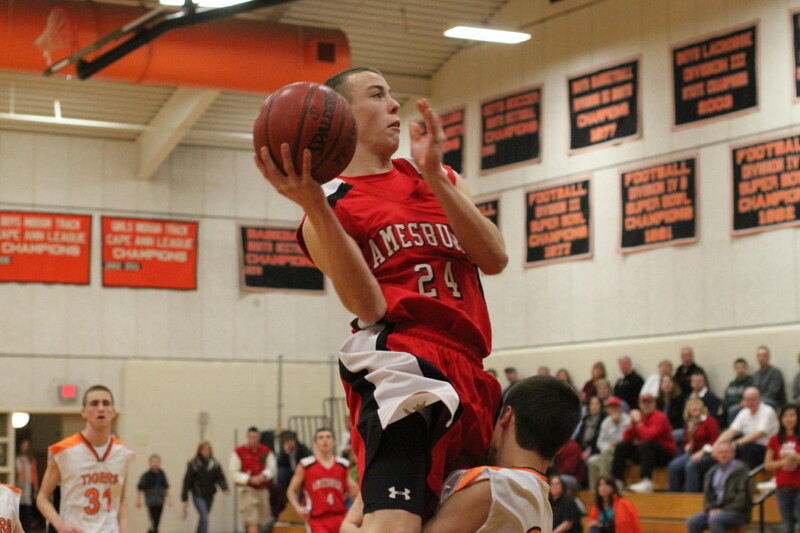 Bob Romeo (Masco) is at least 6’5” with a loud voice. 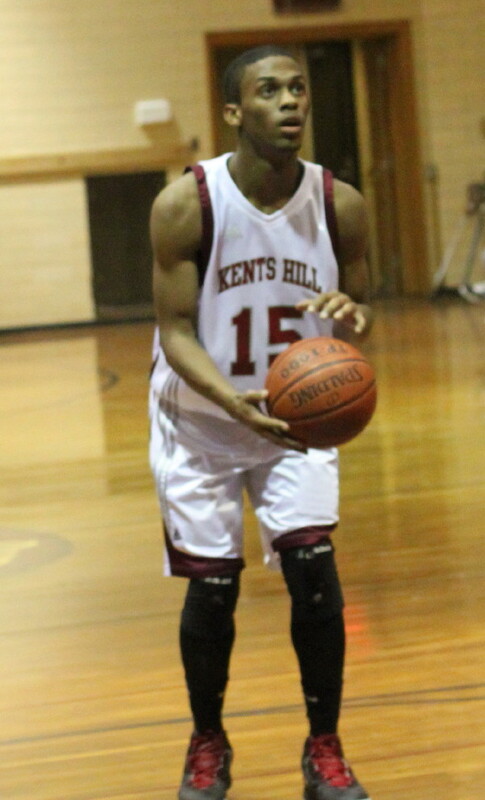 Dressed in a pink shirt for the Coaches vs. Cancer event he was pretty hard to miss. 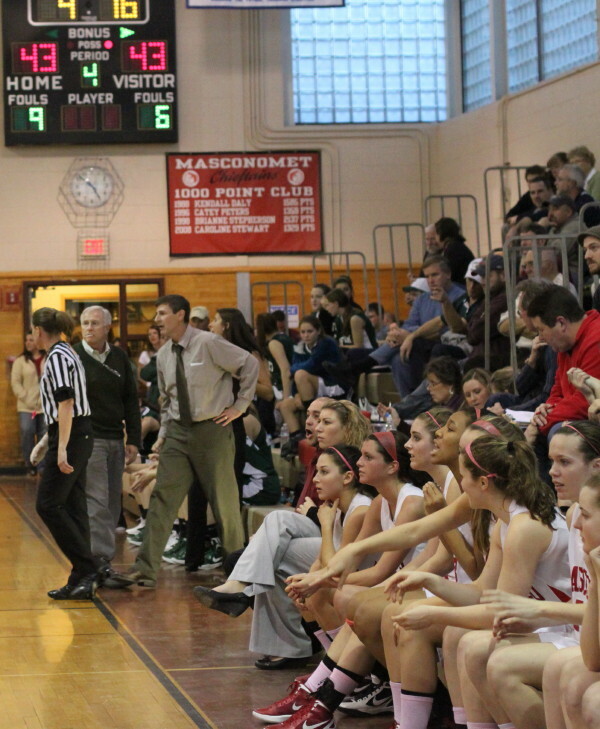 Pentucket coach John McNamara gets a technical in the 4th quarter. Meanwhile, down the other end was Pentucket’s John McNamara. He spent more time on the court than most of his players. I did see him kick the bench – I have a coaching friend who broke a toe doing that. John had a legitimate complain late in the game when someone in the Masco band used their trumpet (?) 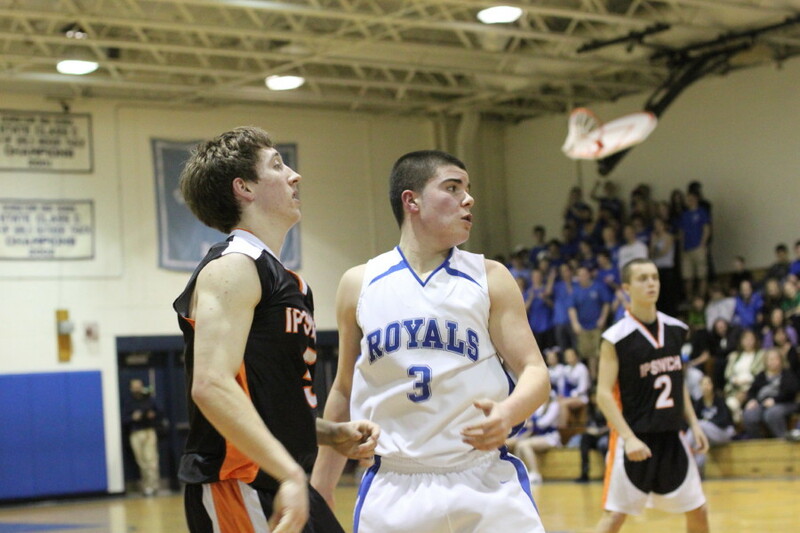 as a noisemaker while Coley Viselli was shooting free throws. Earlier, with 4:16 left John got hit with a technical foul. 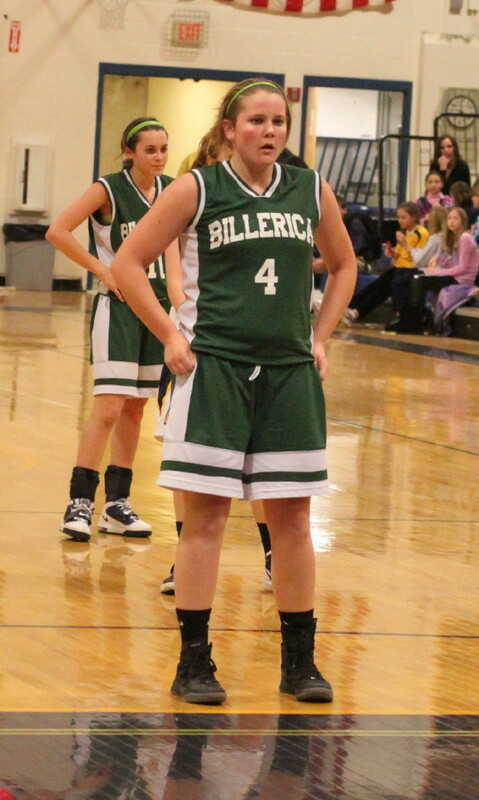 Brooke Stewart made both technical foul shots. 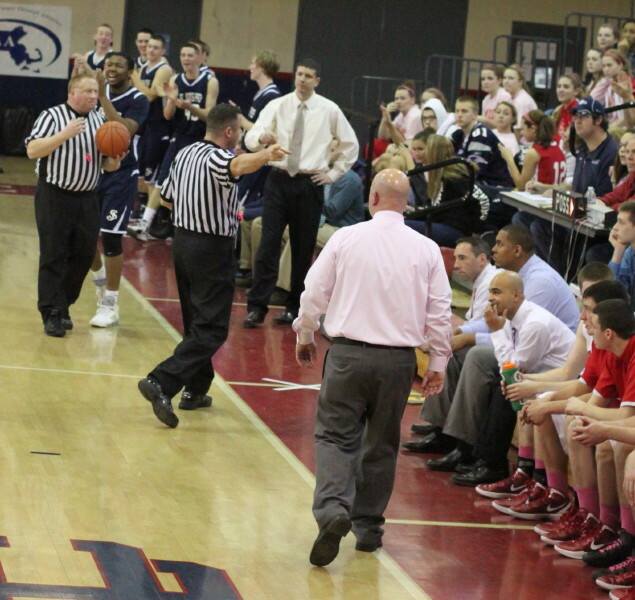 I guess it begs the question, why are coaches allowed on the floor when the game is going on? At the least, it is very dangerous. What do the rules say?? Both coaches have tremendous records and produce competitive teams year after year. Graduation never seems to slow them down. Brooke Stewart (8 points) was overheard saying at halftime that she “had a blister the size of Mexico.” That’s big and surely a distraction. 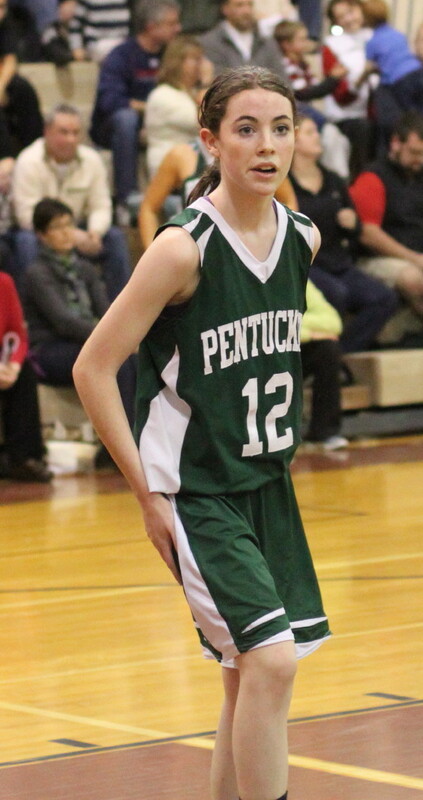 Pentucket has won eight of their last nine. They are at Manchester-Essex on February 3rd. 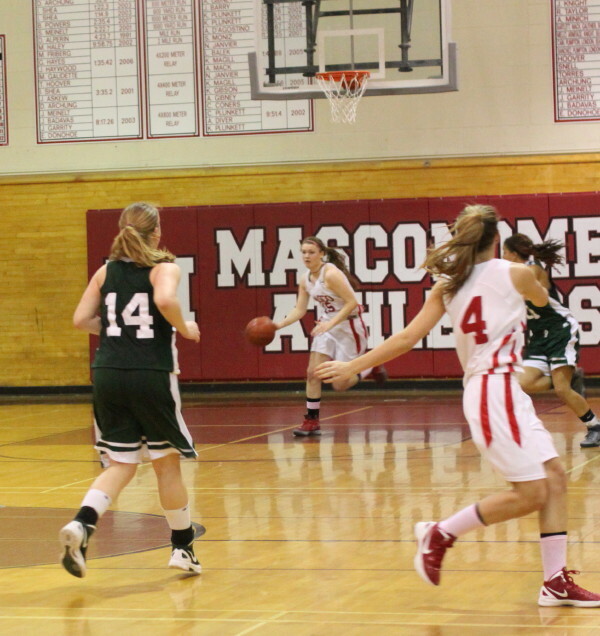 Masco hosts Hamilton-Wenham on January 31st. Driving bare roads with snow nowhere in sight on January 29th? Delightful! 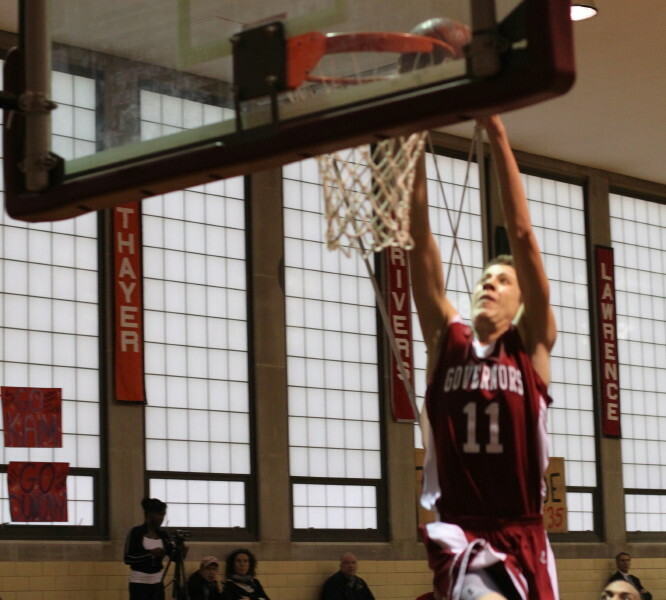 Erik Fyrer attempting layup. 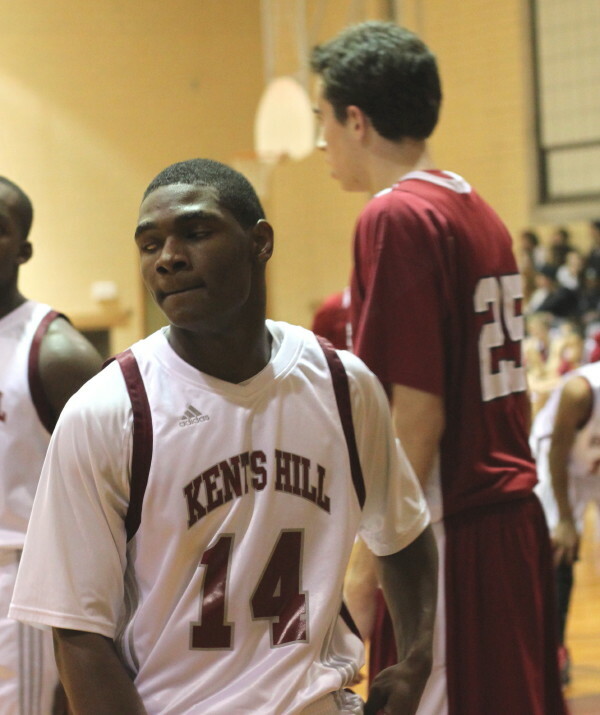 The 6-4 sophomore finished with twenty-one points and sixteen rebounds. 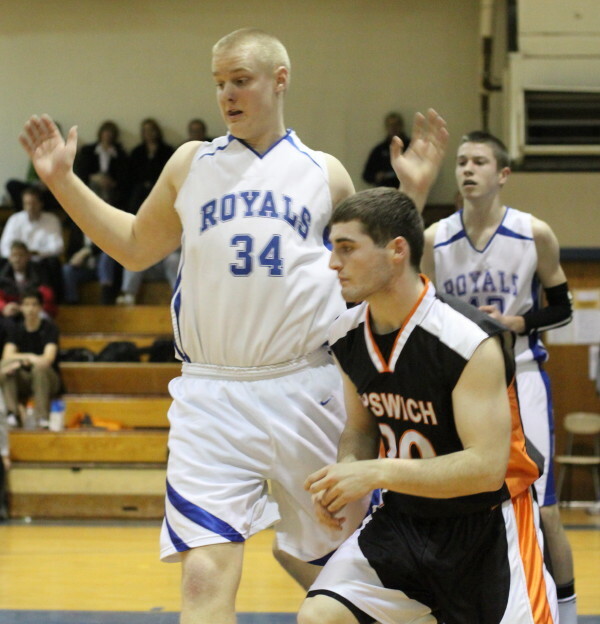 (Ipswich) I am not sure that the Ipswich Tigers could play any better. 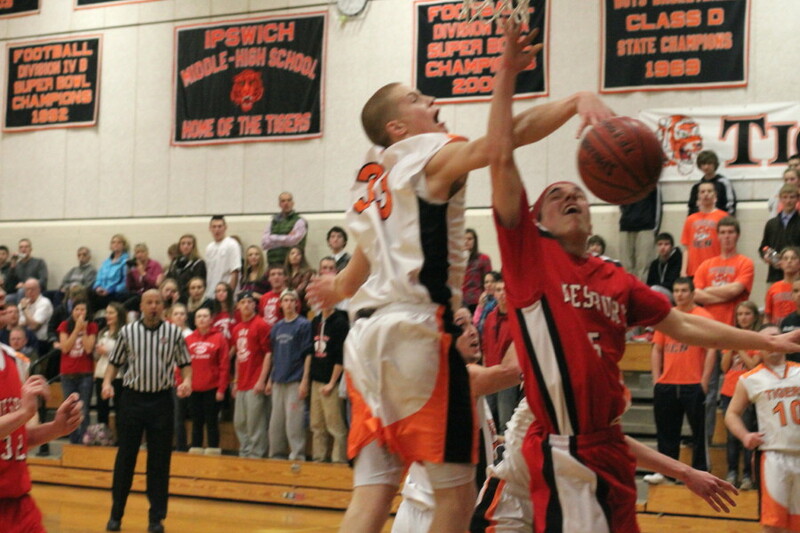 The Tigers demolished Amesbury, 70-54, in a Cape Ann League game on Friday night at Ipswich. Ipswich (2-5 Cape Ann League / 3-9 overall) put an excellent everything on the Indians for 1 ½ quarters and presto the visitors were looking at a 31-7 deficit. You want defense. 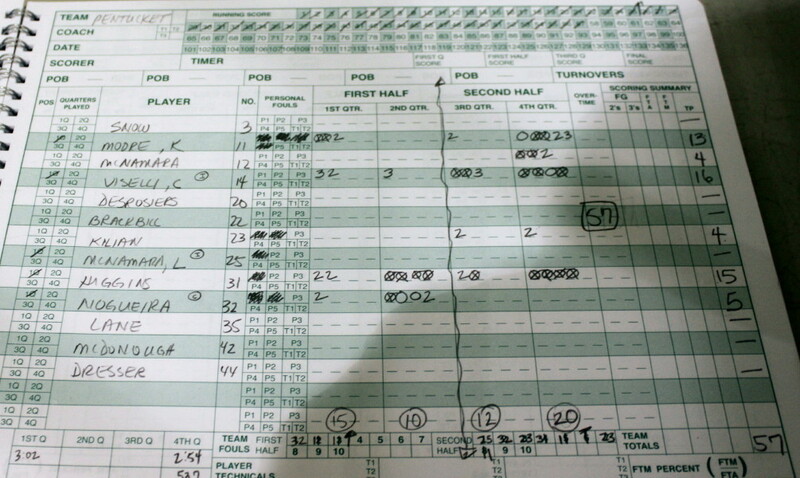 The Tiger pressure forced eleven Amesbury first half turnovers. You want scoring. 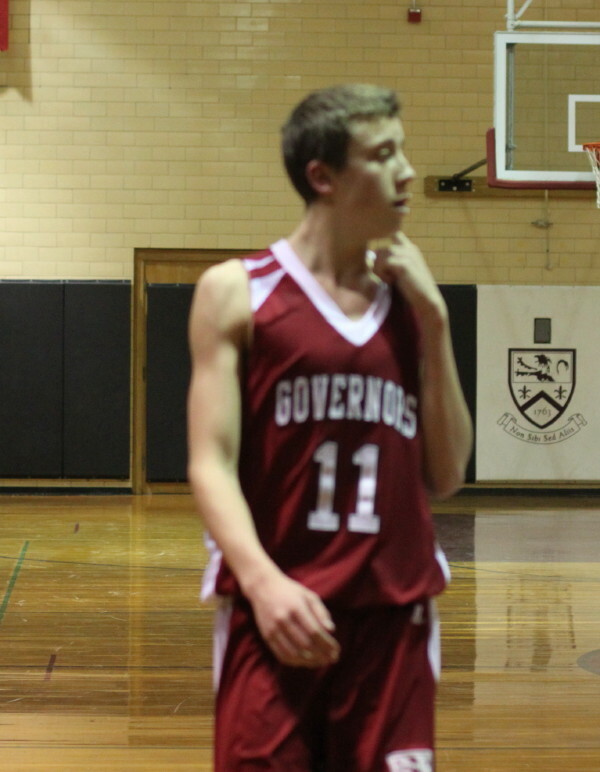 Ipswich had 6-4 Erik Fyrer (21 points) dominating in the paint while Brenden Gallagher (12 points with three 3’s) and Dan O’Flynn (18 points with four 3’s) stroked accurately from long range. It was quite a show. 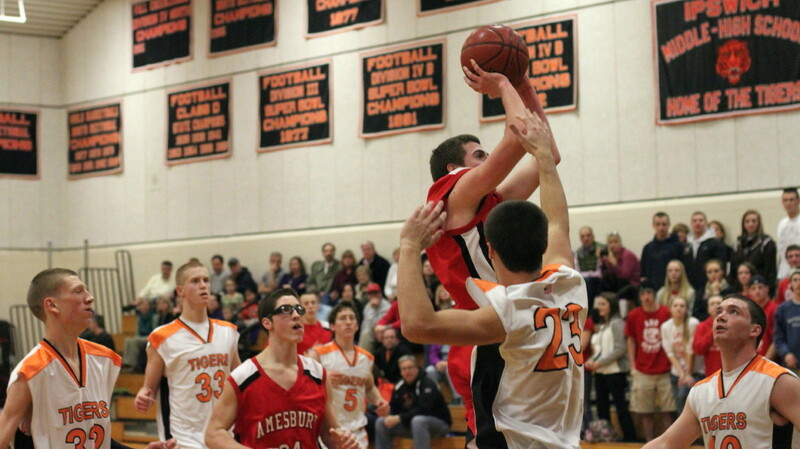 Amesbury had defeated Ipswich in the first meeting (60-56) in overtime and had won three of their last five so there wasn’t any certainty even with a 31-7 lead that the Tigers (losers of seven of their last eight) could hold the lead. But they did. 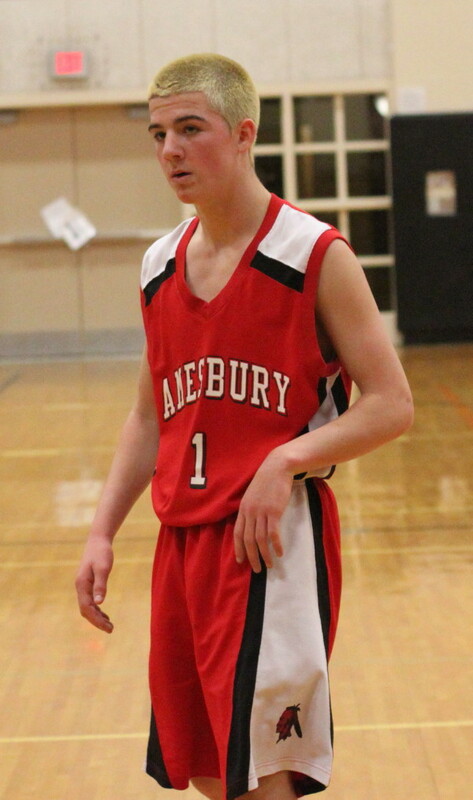 Amesbury (1-5 in CAL / 4-10 overall) actually “won” the last 2 ½ quarters (47-39) mostly via the long ball – they made nine of them. However, that early deficit was way too much to recover from. Ipswich would get the lead to 38-11 on a Louie Galanis triple from Brenden Gallagher with less than two minutes in the first half. 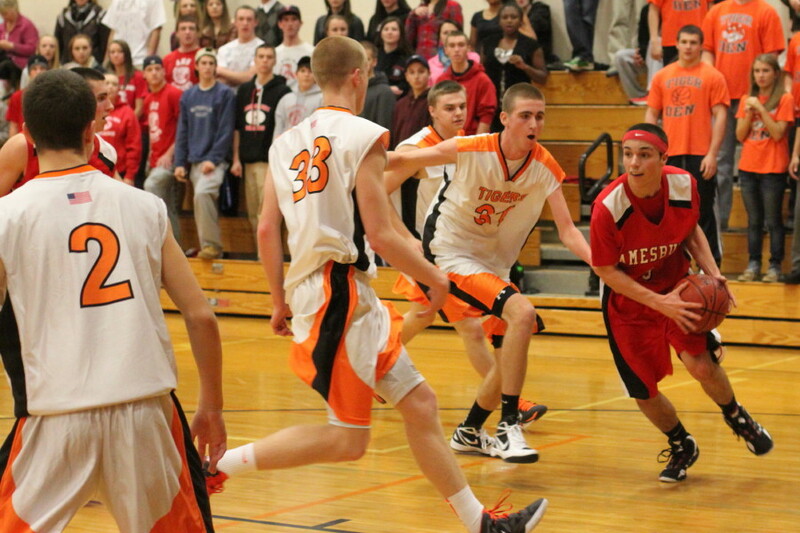 Early in the final quarter a couple of 3’s by Dan O’Flynn pushed the Tigers ahead, 58-32. 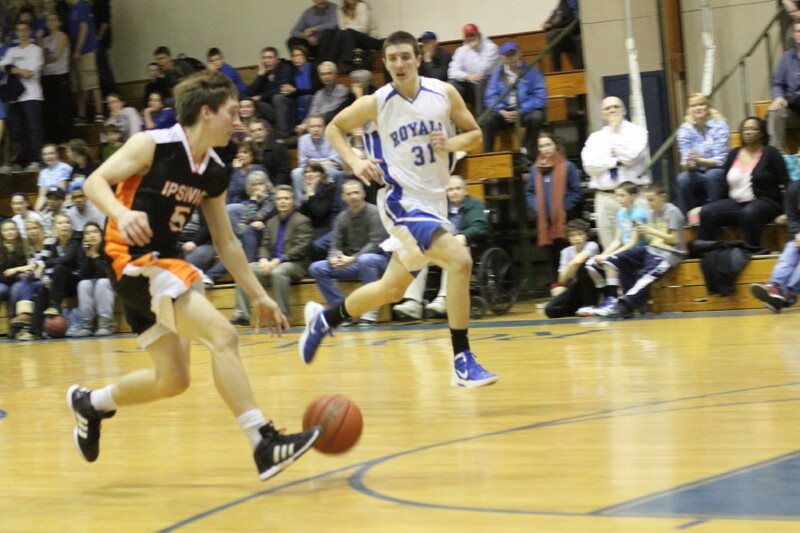 The Indians answered with two minutes of their best basketball, running ten straight thanks to 3’s from Curran O’Connor and Tommy Connors and layups by Matt Talbot and Jack Fortin. 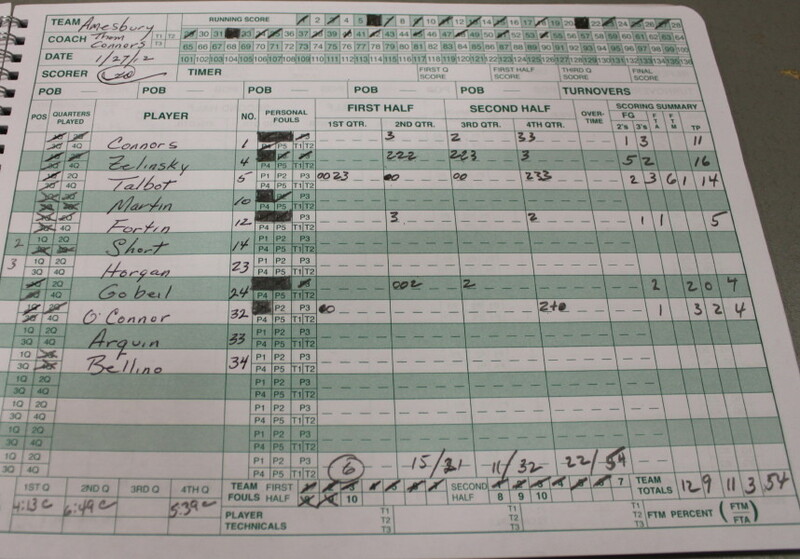 This rush of points caused Tiger coach Alan LaRoche to call a timeout, as his team’s twenty-six point lead had shrunk to sixteen. I heard shouting during the timeout and the Tigers responded in the next minute with a jumper from Tyler Hale and a three from Dan O’Flynn, both hoops assisted by Erik Fyrer. 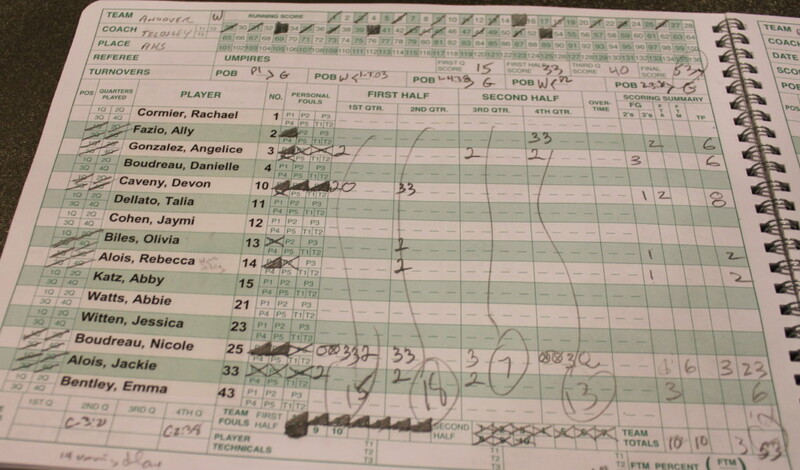 This put the lead back into the comfort zone and both team’s reserves finished out the last four minutes. Erik Fyrer had a terrific game. 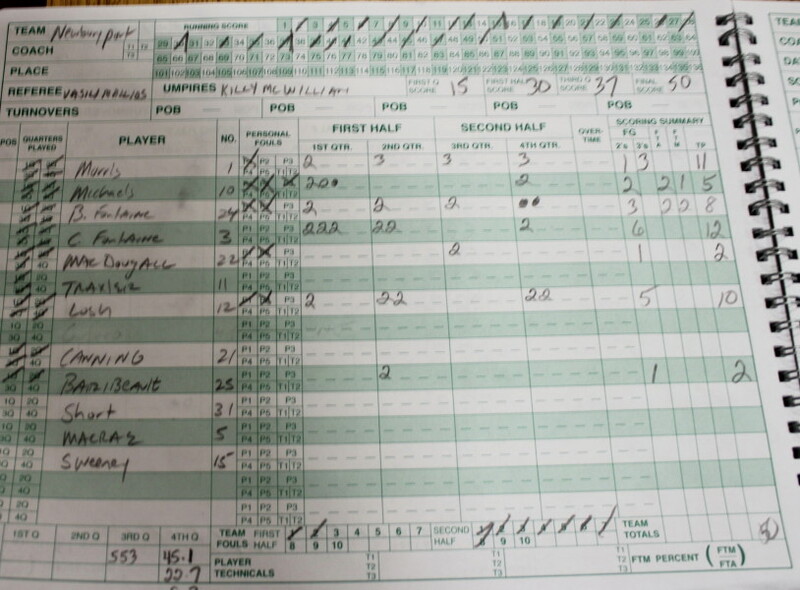 In the first meeting, Erik got into foul trouble and played short minutes. Not this time. 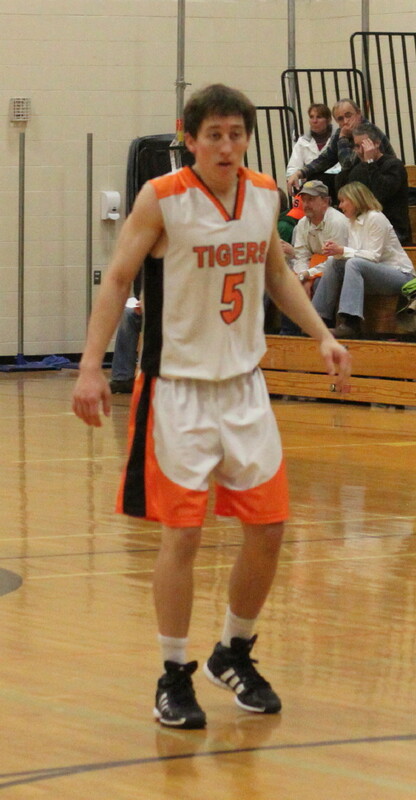 The sophomore was a big part of the Tigers’ fast start, collecting ten points early on. 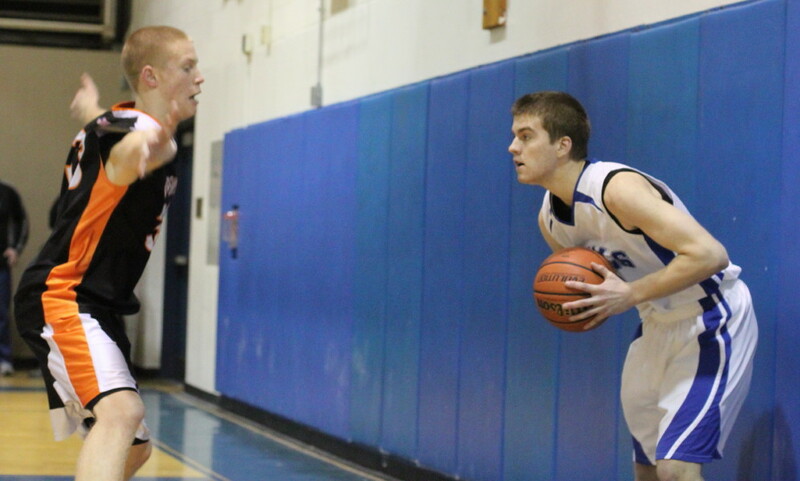 He owned the boards too, grabbing sixteen rebounds (Thanks, Mitch MacDonald) and blocked several shots. The normal righty showed a good left hand on one inside move. 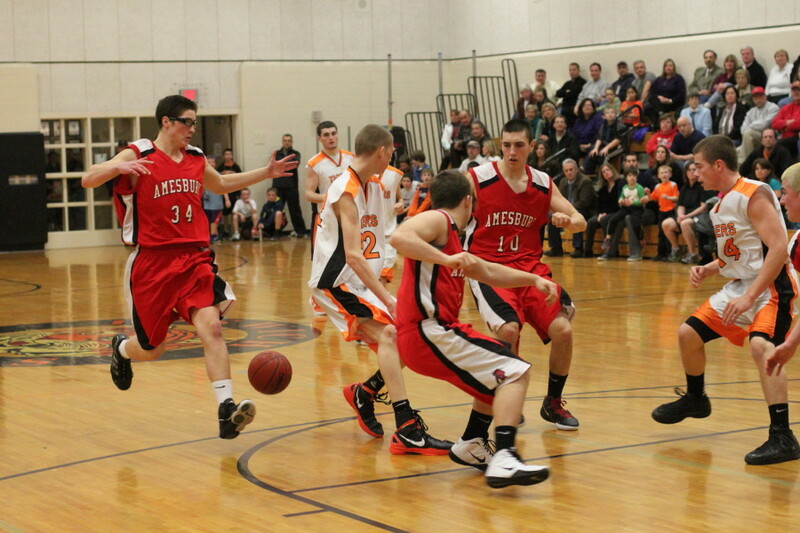 Mike Zelinksy (16), Matt Talbot (14), and Tommy Connors (11) led the Amesbury scorers. 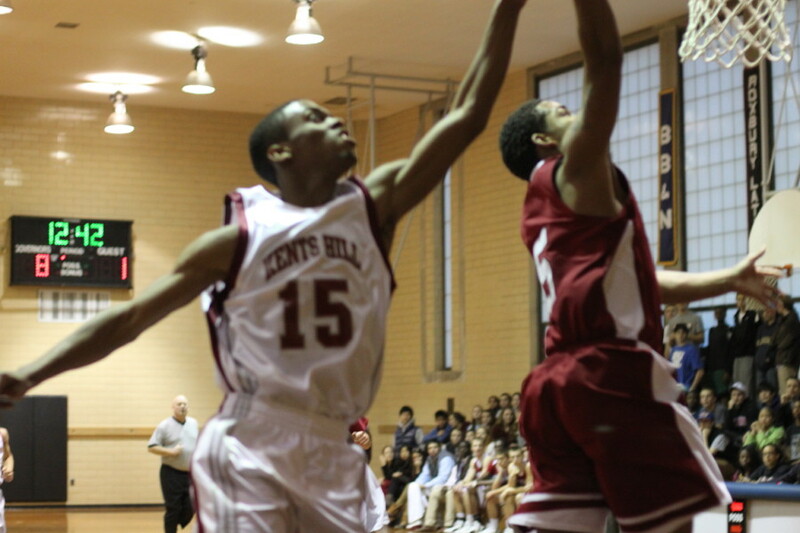 Mike tossed up a no-look, backhanded layup that had no business going in……..but did. 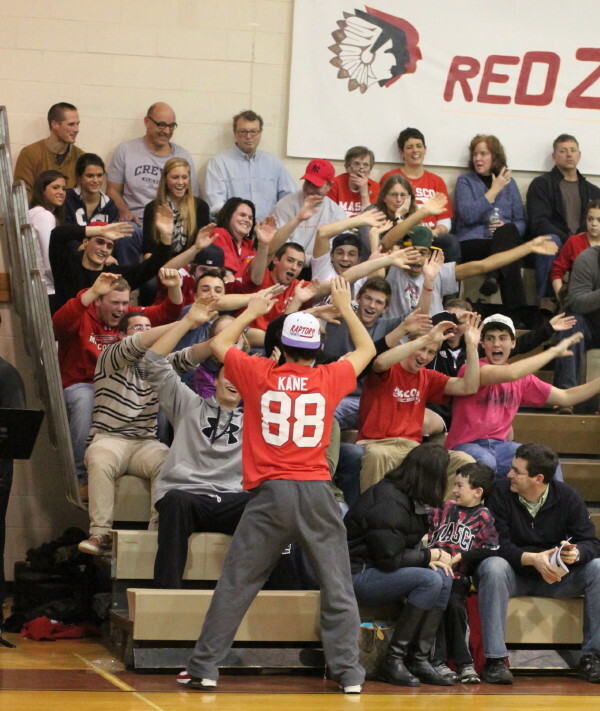 The Ipswich student section and the Amesbury student section did their best to out-do each other. 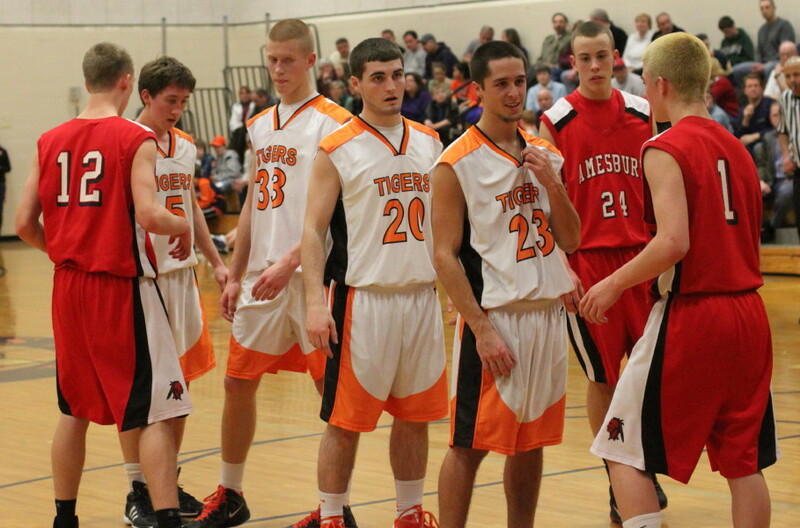 Tough for the Amesbury kids since their team trailed big early and never really threatened to overtake the Tigers. 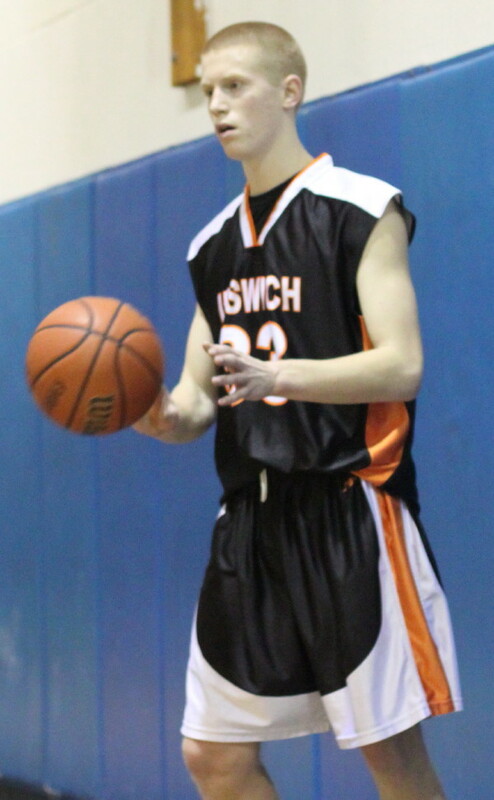 Ipswich next plays at Georgetown on January 30th. I saw Ipswich defeat G’Town in the first meeting. 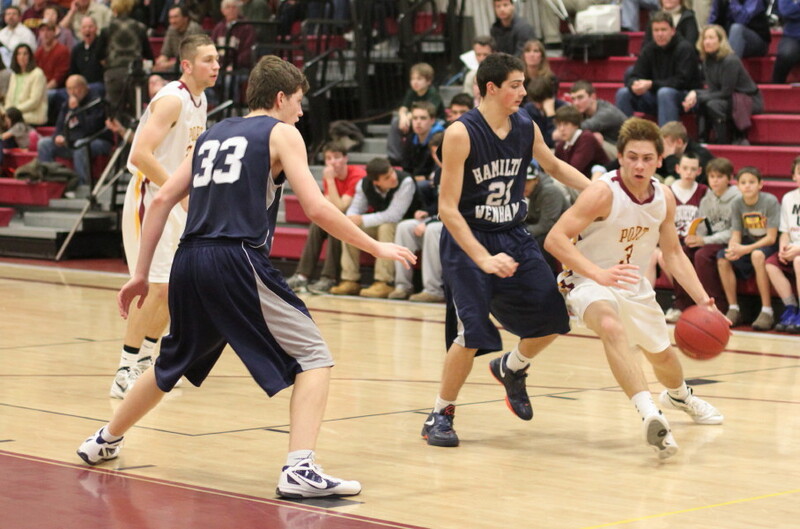 Amesbury gets Lynnfield at home on January 31st. 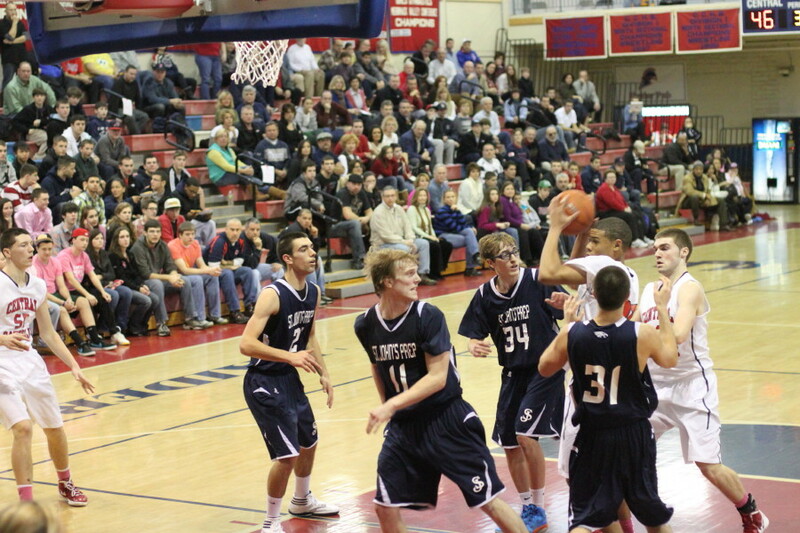 Shane Jenkins scores a crucial basket in the last minute with a backdoor cut and getting a pass from Stephen Tam. 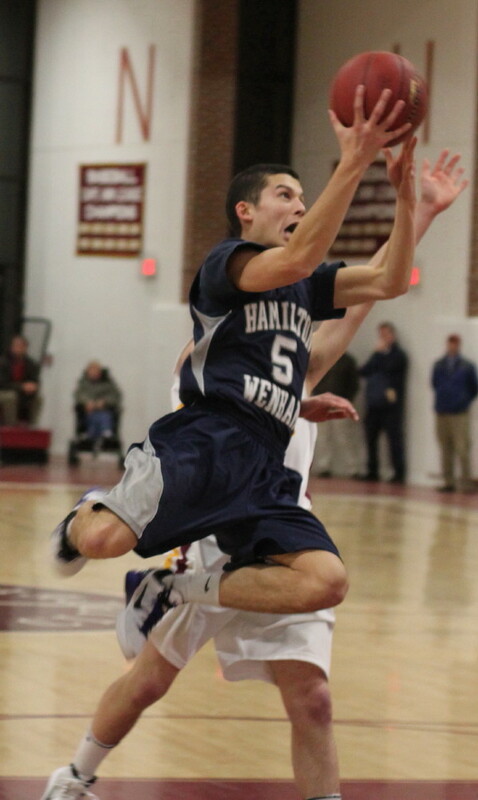 (Newburyport) Hamilton-Wenham (8-3) broke away from a 47-47 tie in the last two minutes and defeated Newburyport, 55-50, on a warm Tuesday night at Newburyport. 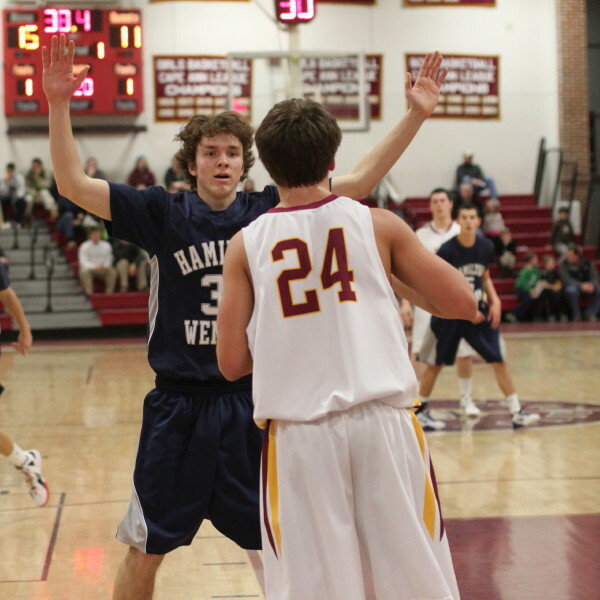 The Clippers (10-3) had won the December meeting between these two (45-39) at HW. 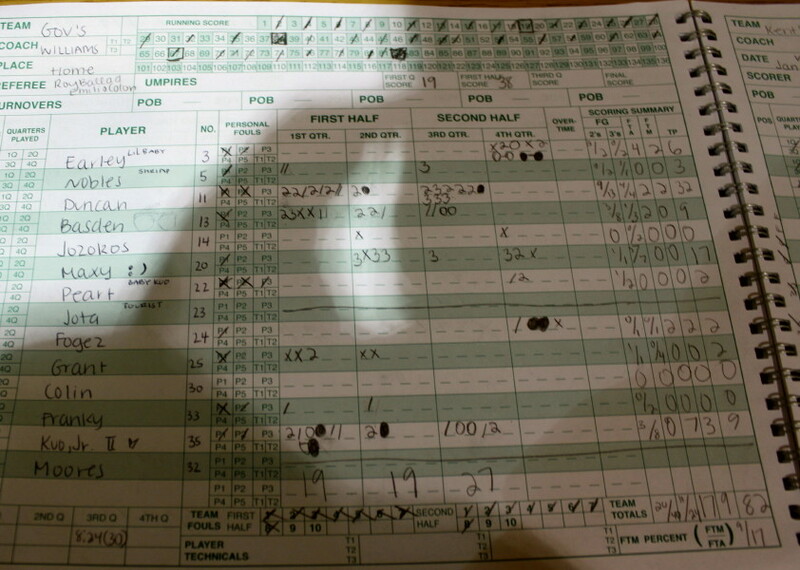 In this one the home team couldn’t hold a ten-point (30-20) second quarter lead or execute very well on either end in the final two minutes and it cost them dearly. 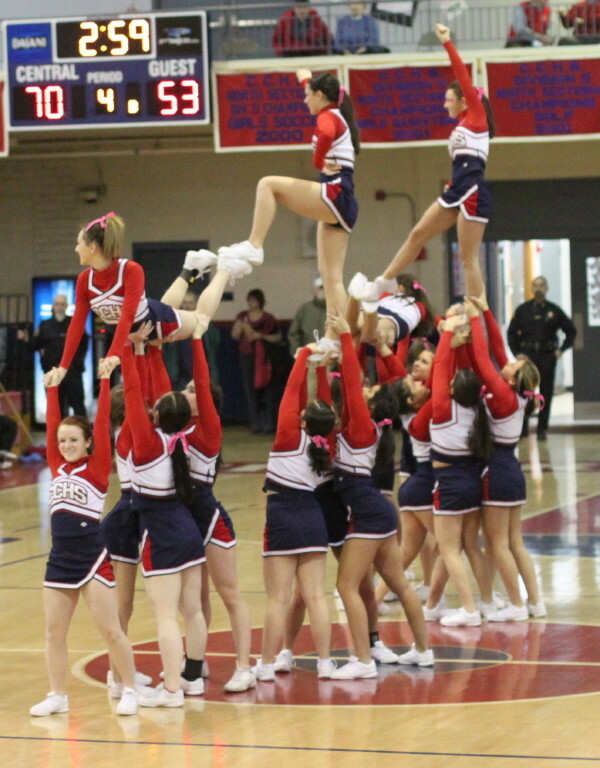 While the Generals looked to be in deep trouble trailing by ten points in the second quarter, the Clippers looked done when they fell behind, 45-39, in the fourth quarter. Both teams recovered nicely and turned it into an exciting two-minute game. 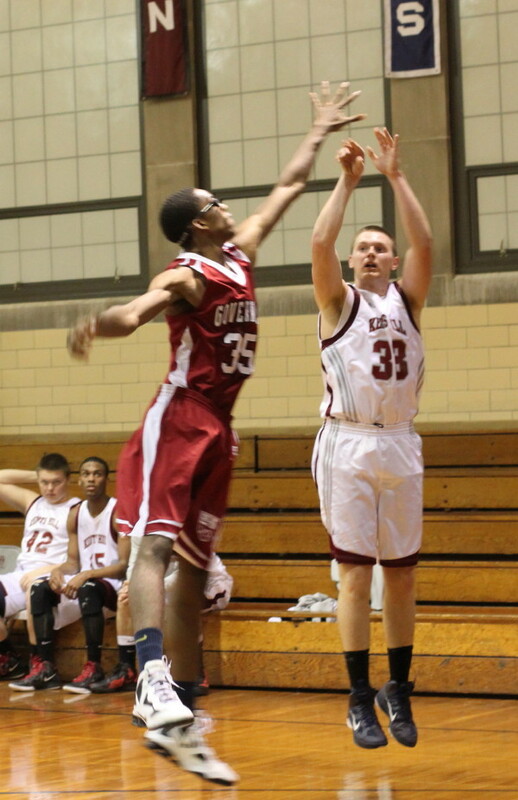 Freshman James Foye (10 points) opened the scoring in the “end game” with two clutch free throws. 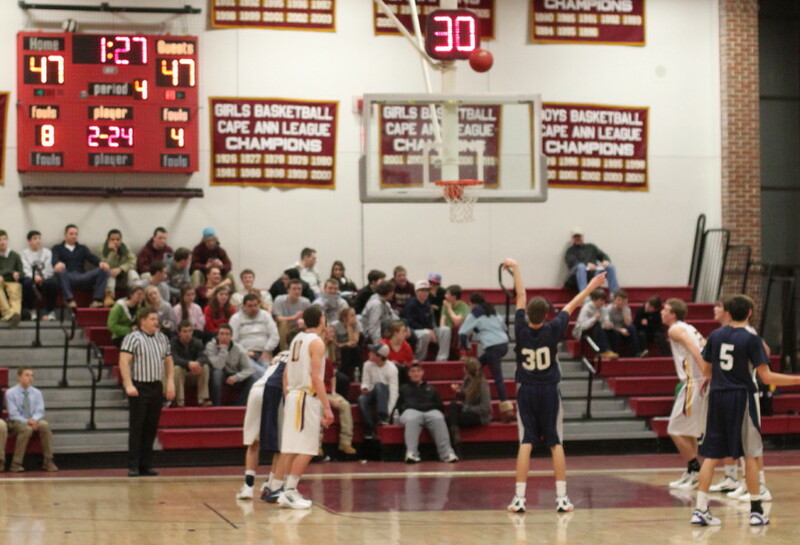 After a Newburyport miss, Stephen Tam (12 points) dribbled around near the top of the key appearing to be intent on taking a shot. Wrong assumption! 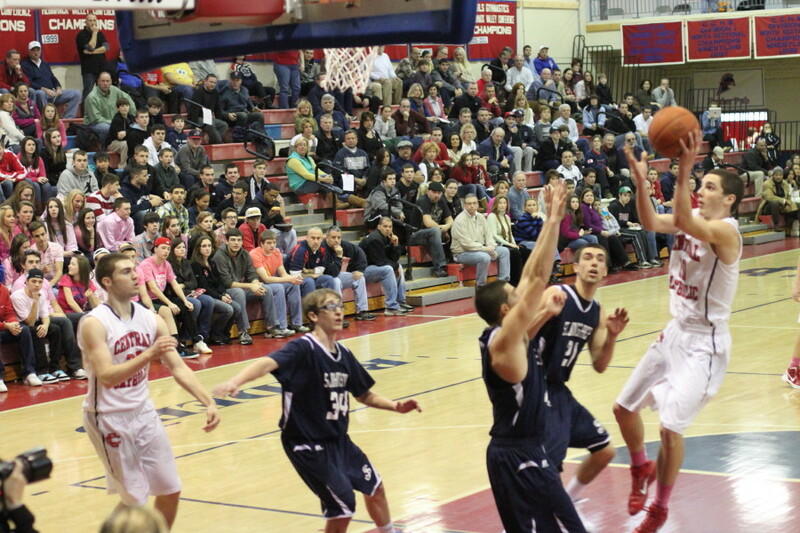 Shane Jenkins (9 points) made a backdoor cut and caught the Clippers napping and made a layup. 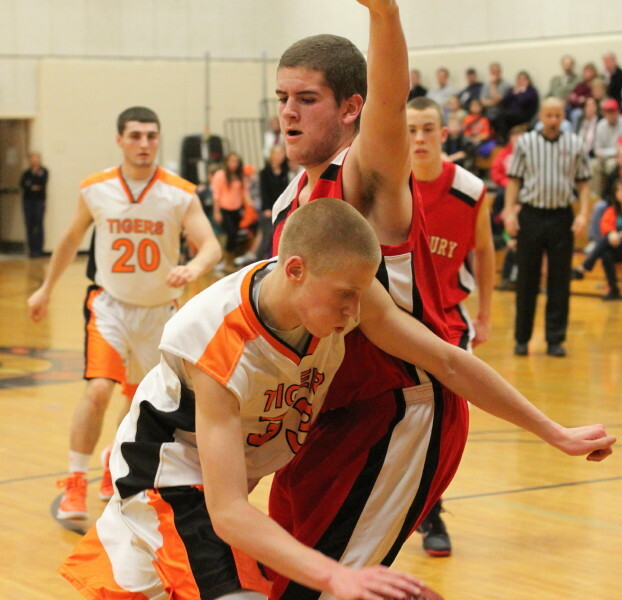 Then a Colby Morris turnover sent James Foye off for another layup. 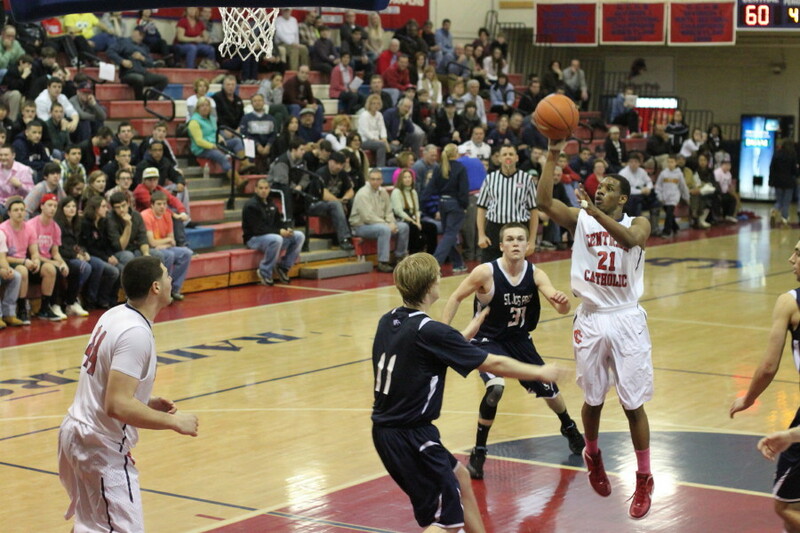 That put the Generals ahead by six (53-47) with only twenty-eight seconds left. 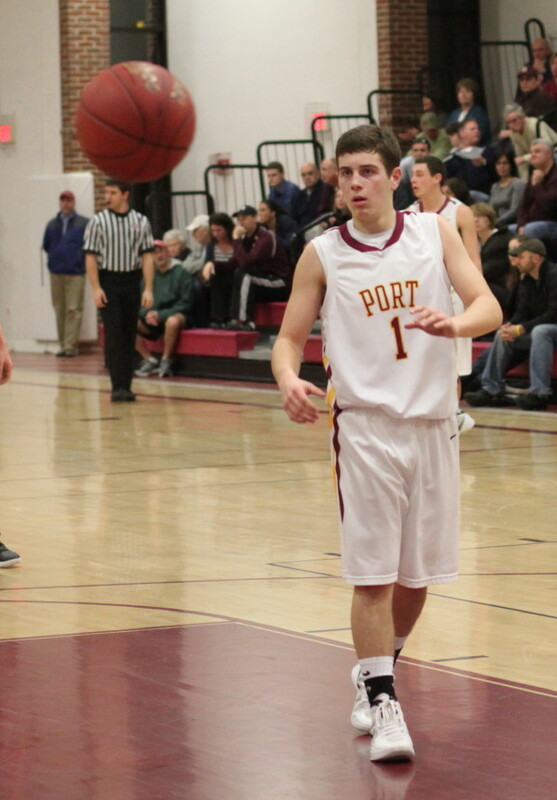 A triple by Colby Morris (11 points), assisted by Brett Fontaine, quickly had Newburyport within three with twenty-two seconds left. After a timeout, the pressuring Clippers got the turnover they needed but just as quickly turned the ball back over to HW. 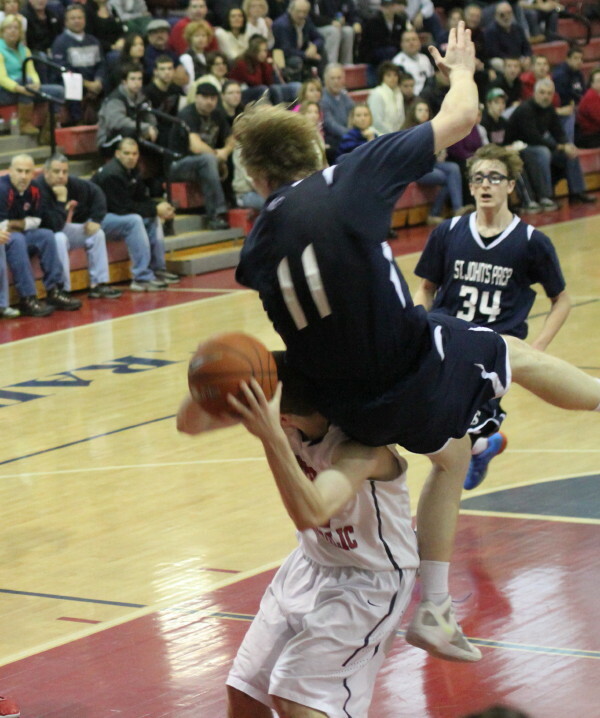 Off went Stephen Tam with the fumble for another layup and this game was over. Tough loss for the Clippers. This makes them 4-2 in the Cape Ann League D2 standings. HW is now 4-1. The Generals have won the division the last two seasons. 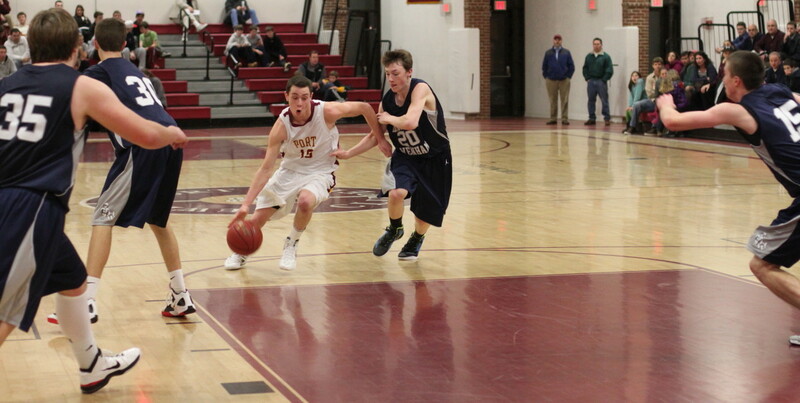 Newburyport got that ten-point lead in the second quarter thanks to a 9-2 run over three minutes. 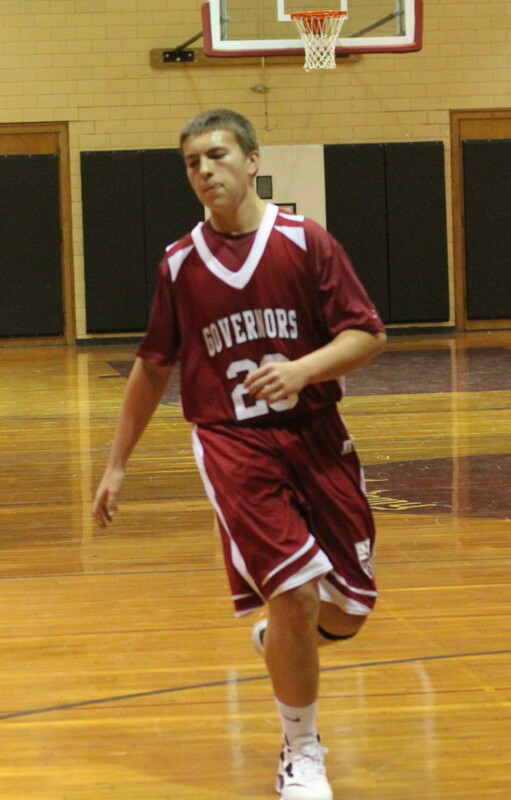 Colby Morris (11 points) had two assists and a triple in that surge. It took HW 2 ½ minutes to get nine of those points back. 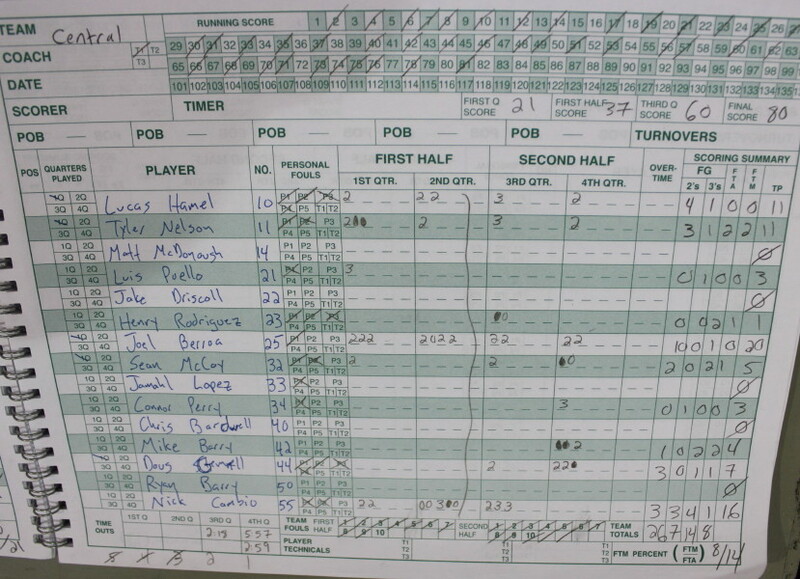 The killer basket in their nine straight was Jake Lindland’s desperation long one at the buzzer. 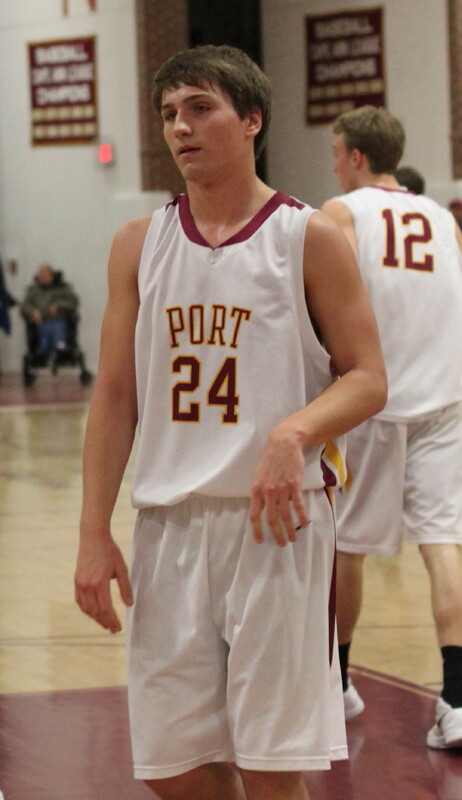 It was another case of Newburyport heavily defending Stephen Tam and last year’s CAL D2 Player of the Year finding an open teammate. The Clippers looked cooked when HW put a 13-2 run on them during a 3-minute segment that stretched into the final quarter. 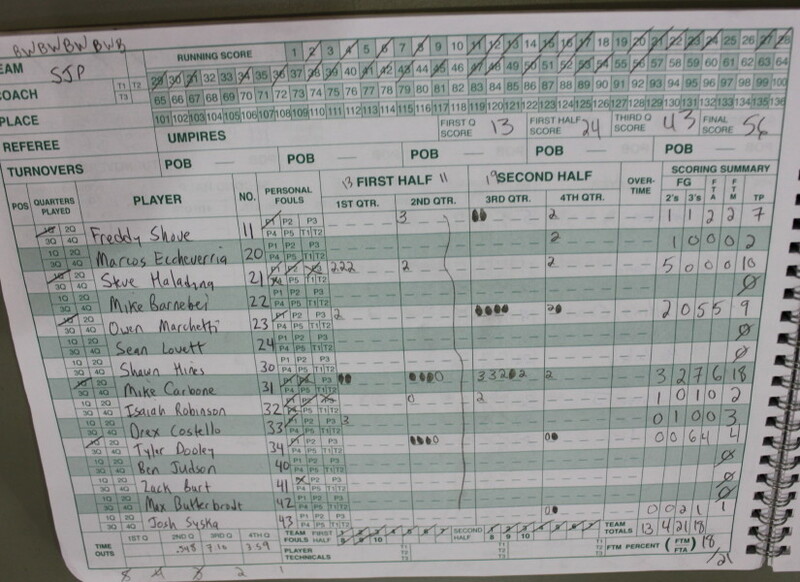 Stephen Tam scored off a turnover and added a three. 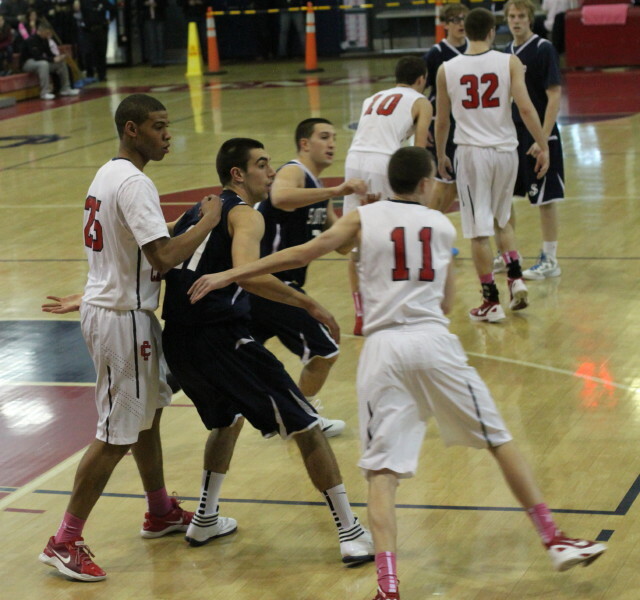 Ryan Richard came off the HW bench to contribute two baskets from in close. 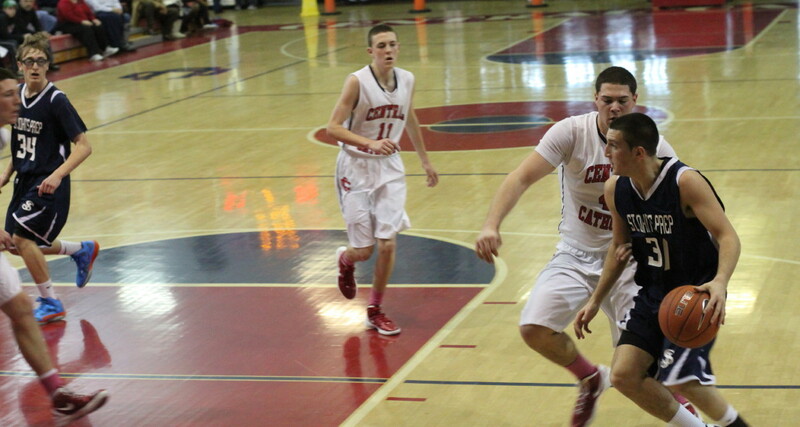 That 45-39 lead looked solid but four minutes later the hustling Clippers earned a 47-47 tie. 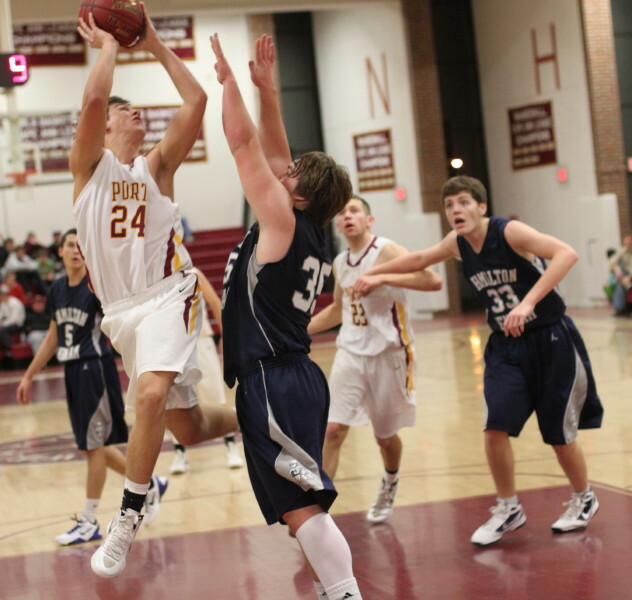 Two of the Clipper baskets were converted rebounds by Colton Fontaine (12 points) and Alex Losh (10 points). Stephen Tam did a nice job defending Brett Fontaine. Ian Michaels did the same defending Stephen Tam. 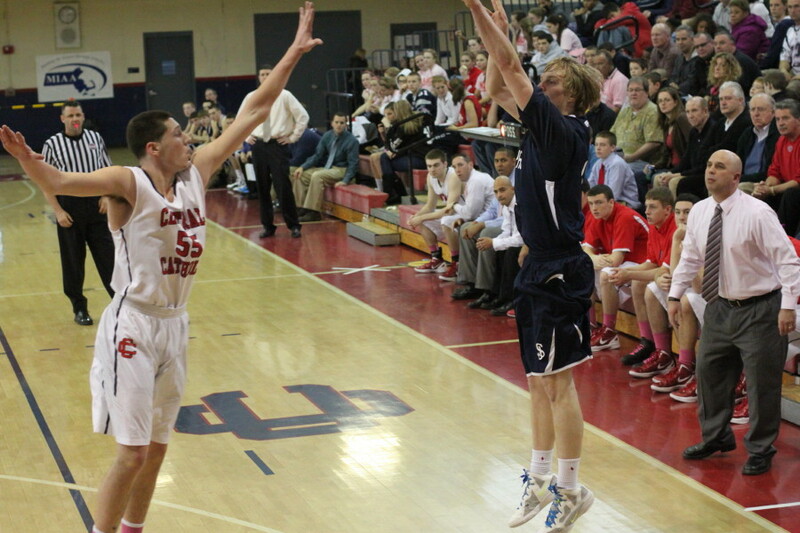 Ryan Willis (9 points) had three long ones for the Generals. 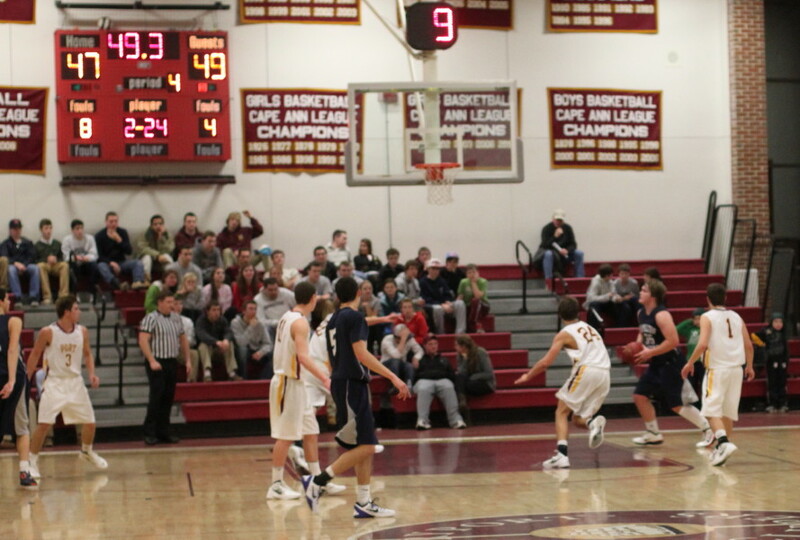 Colby Morris has three 3’s for Newburyport. 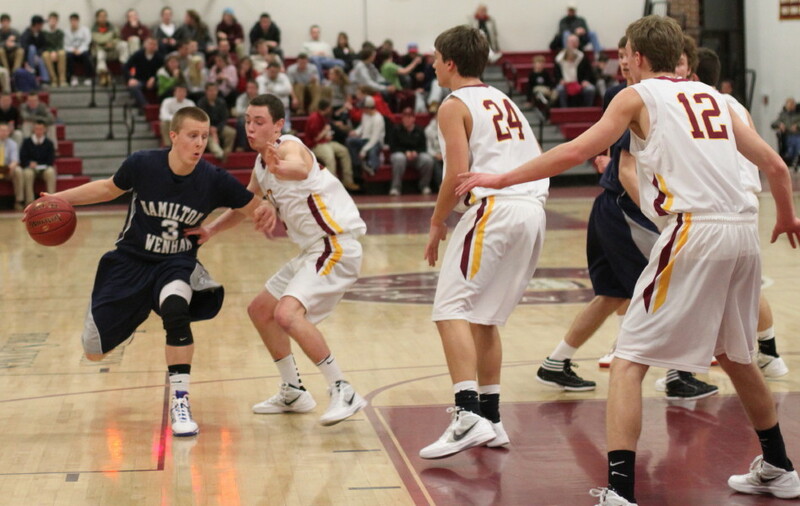 Senior Jake Lindland is recovering from a preseason knee injury. His minutes have been limited so far. 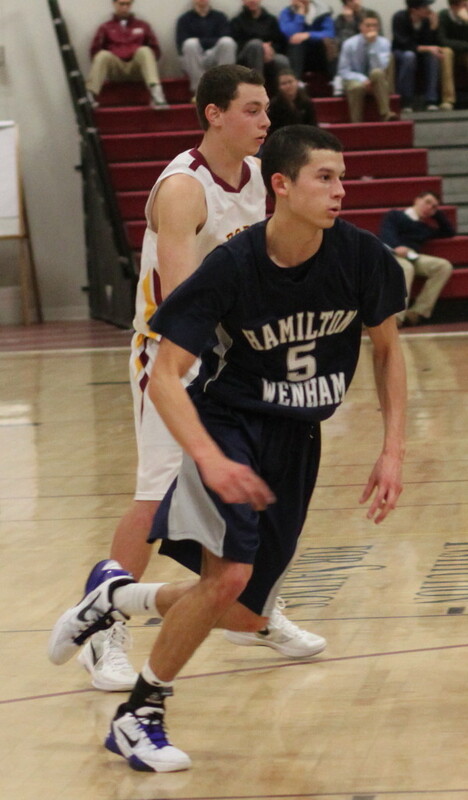 Hamilton-Wenham was very content to run an offense on the perimeter looking for an opening for a long one. The Clippers looked to get closer to the basket. HW is 38-9 over the last 2+ seasons.